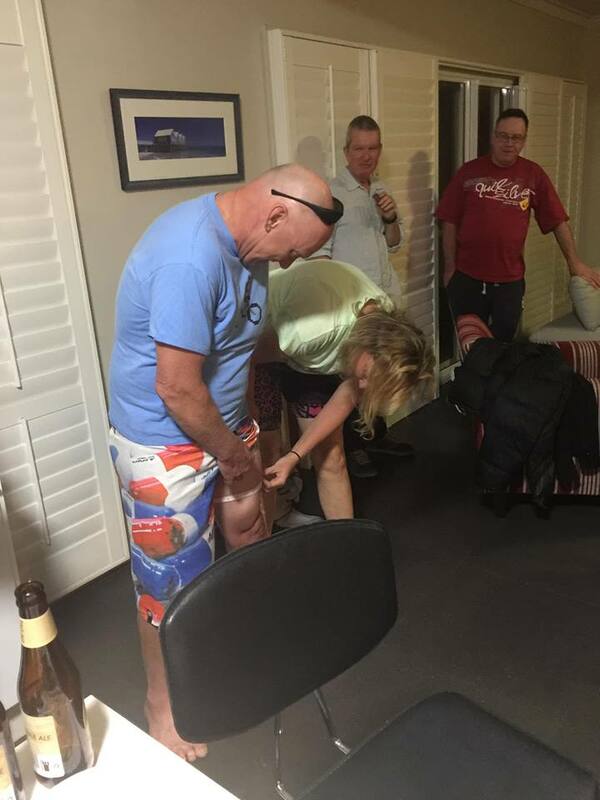 Pemberton – lessons not learnt. 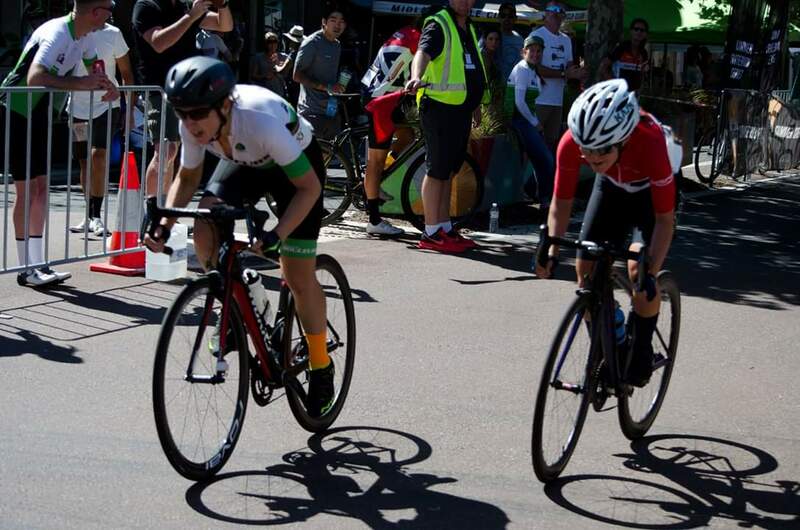 A crit course that has a 26m climb in every lap and attracts young whippet climbers is a bad idea. 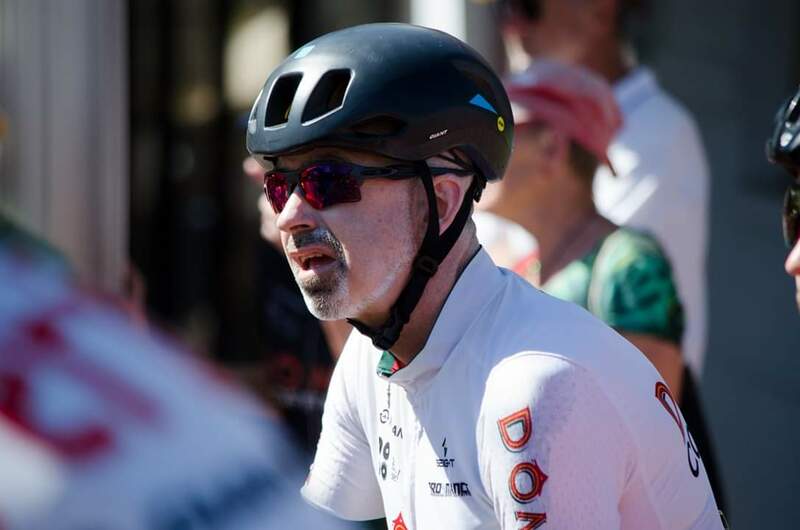 Yet, knowing all this here we were again, the eve before a road race that will have us up against a bunch of smarter guys that left the crits aside. Again. Up and down, up and down, up and down, like a 2 year old you’re trying to get settled to sleep …… you get the idea. And the pub is at the top of the hill, by the way. Crit time and SPR Base Camp was established. Only a few hardy Green souls set out for the challenge. D Men with Dean Fehlberg was first up. The group split over a few laps with Deano holding court at the front for most laps passing the start finish – the man knows a photo opp. When it came to the final, painful, slow motion sprint, Deano held off all comers and took the prize! 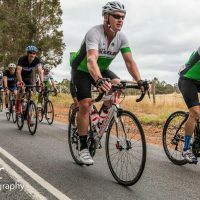 C Men was a different field this year, with the under agers in their own category, saving a the legs of the older blokes. Unlike previous years there was a panicked grab of brakes through the fast downhill corner every lap. Historically there has been a panicked clenching of bum cheeks, as too much speed pushed wheels out to the gutter. And grass. And sometimes even into the row of rosebushes at number 48. A sedate, “masters” approach was engaged and saw more squeezing brake lever than pelvic floor muscles. A few non-attacks brightened things up, but the group was almost entirely together at the bell lap. Mo and the Greens awaited bedlam at the final run at the downhill corner, expecting Crash-Bandicoot style lines to be taken, but nothing. Mo pulled a tight line, rolled up the inside with ease (pro tip – get off the brakes.!!! OK not such a pro tip) and managed to accidentally attack. Too far out. Waaay too far. Well, we’re here now. And so off we went with everything that was left after 10 painful laps – which was not a lot. Accepting fate Mo, was swamped half way up the final climb, and then had time for a little chit-chat with Jedsman over the last 100m. It was a fun little hit and proved there was some power to be had in those chicken legs. Sadly, post race, Mo’s bike was knocked over at the SPR tent and smashed up the left shifter. Not noticed until the following morning at warm up, there was no more big chain ring for Race day. Beware the careless <insert other clubname> riders that knock things over and just ride away. Hmmmmmmmmm. 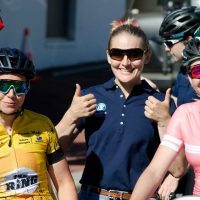 Women’s B grade had Jonelle Ainsworth starting, but had a DNF today. This course….! 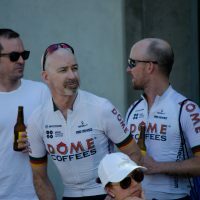 Men’s B grade and we saw a sign of the impending end of the world – Bonner v1.0 showing a pain face. True story – this actually happened. He IS human. 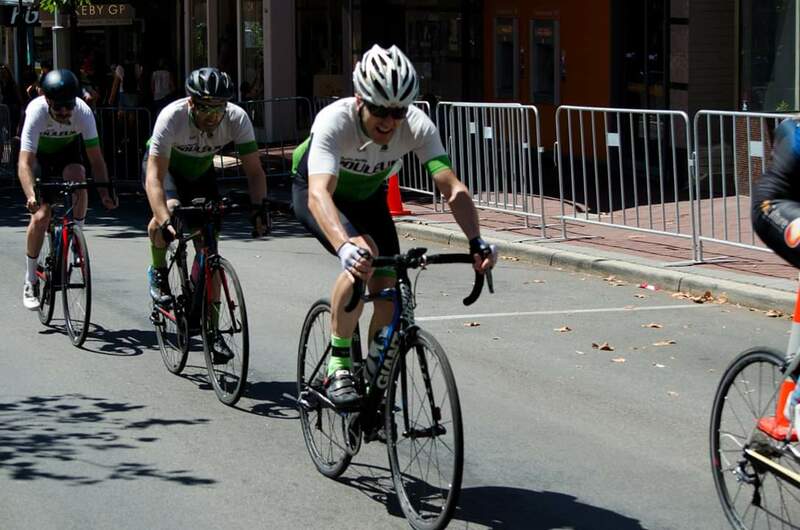 The group fractured several times through the race, with Italian Stallion Carnicelli and NowhereMan playing it coy. V1.0 wasn’t to finish with the Young Bucks of B today. 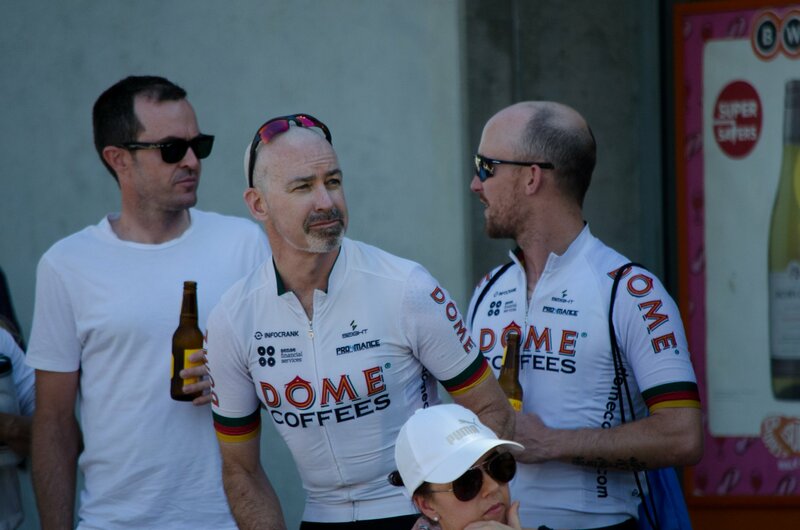 Nor was Thorman, who spent too much time fronting the bunch and slipped away for an early shandy. 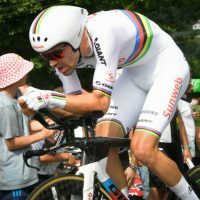 Approaching the bell lap on the penultimate climb, The Stallion appeared around the uphill corner, screaming up at speed. Could he hold? This was a course for a hot climber, after all. Cresting the start/finish there were 2 off the front, but by the decent NowhereMan was somewhere – and somewhere happened to be first through the apex. Full Gas around the back straight, NowhereMan held the chasing bunch away, but in a mad chase he was just caught on the line, fading at the end of a loooooooong kick. A thrilling finish, netting silver for NowhereMan. A women, and another new face (and I am assured short-lived) with Bex joining the A ranks for a hit. Time/distance and a smaller field was the panacea for dipping those Irish toes in higher grade. Joining were Olesya (FromRussiaWithLove) and Bonner v2.0. It was V2.0 that took the lead and stayed put – if The Librarian ever ignored any message from the crowd it had to be “Get Off The Front”. V2.0 also missed the memo. V2.0 plugged away, The Collective Youth, FRWL and Bex in tow, but none of the Green crew were able to hold on through the final lap. 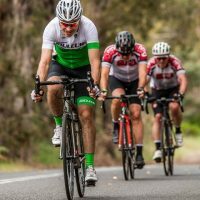 And so it was Green that tailed off the bunch. For the record, a return to B Grade may beckon when returning to race courses for Bex, but Mo be mighty proud of Mrs. Yes, he be. 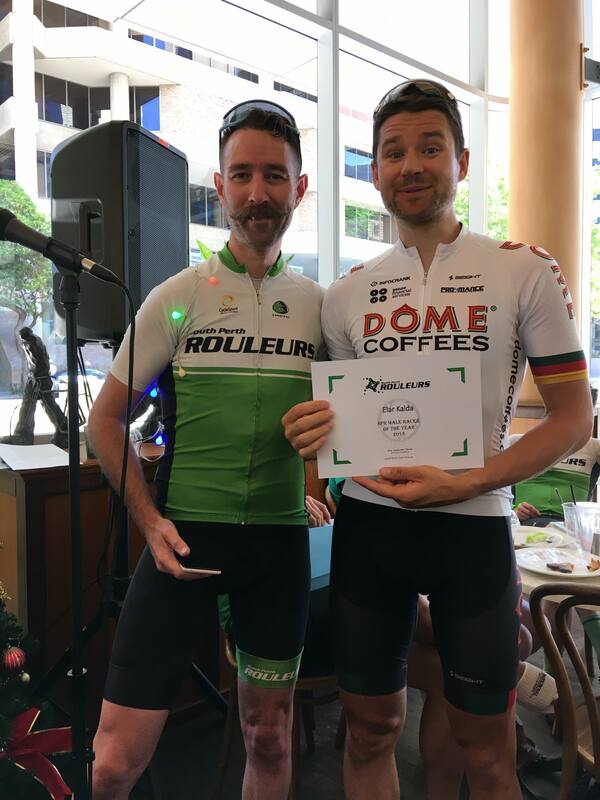 A blokes didn’t have a Greenie to boast of, but did have Elar – the BossMan – for Dome. Not so bossy today though. However, when in doubt, you can bet another Wiggins probably wins. And he did. Post-crit it was time to retire to the pub for rehydration and carbo loading – Fish and Chips and a beer. 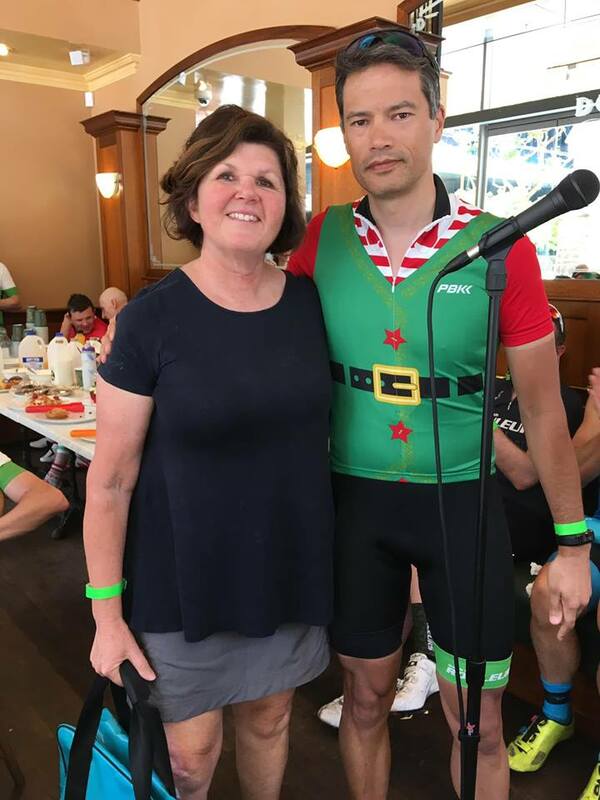 Chatting with Jedsman and Suzanne (Mrs Jeds) over a well-deserved pint was just the medicine for hilly crit legs. Aaaaaaand sleep. It was a warmer start to RR day than last year. More like “hot-water-running-out-mid-shower” than “ice-bath”. Previous years have started under 10deg. 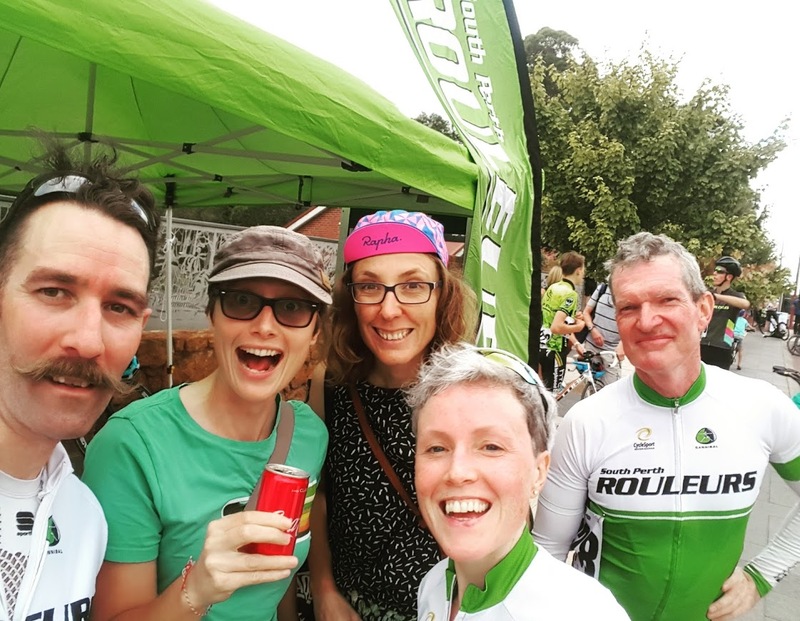 With a mere 150m between the warm cocoon of bed and a start line pointed straight at Pump Hill Rd, we rose, inhaled another Emma Pooley Banoffee Pie breakfast, and got to tent-set-up-mode again. 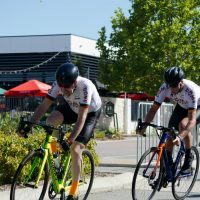 The course is familiar, flowing out of town, up the hill and rolling through rural fields of vineyards, orchards and animal paddocks. Literally 1 min from the start line is a 10% incline. And with it, the start of attacking racing. If you’re not warmed up, you’ll have a nice quiet solo ride through the countryside from here after. When you’ve got a thirst of it, Rosco cracks a Solo. C Men had an even number of SPR to MCC in the start list. AfterBurner corralling the troops, Ross The Solo Man (bring back that wiiild hair! ), Ralpha, Stalker, Deano, Jedsman and Mo. With one chain ring (it’s still raw). 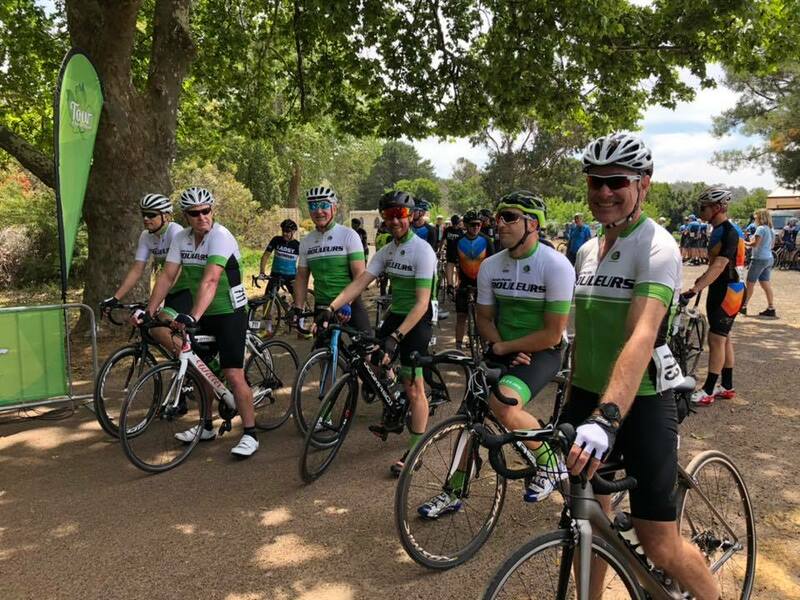 The bunch maintained an order through the first Pump Hill climb, however it appears the fixie riders of the world know nothing, and the “one gear to rule them all” mantra is absolute rubbish. Accelerating over the crest, Mo was already spun out and resigned to chasing. At the close of the 1st lap approaching town, there had been a touch of wheels resulting in 2 down, and one very broken bike frame – the FB pic of the bike is awful. The group split, accelerated through the start finish and that was day done for a few more. 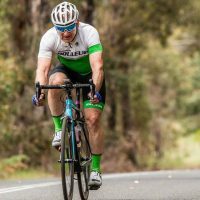 Another lap and a wild attack came from Rosco, The Solo Man (was there ever a more appropriate nick name) with 8km to go. 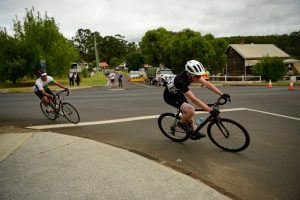 With a lead of hundreds of metres on the approach to the final corner at 3km, there was a big delay in the chase starting. 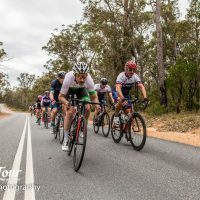 As it happened, The Solo Man was caught on the descent to town and a mad sprint to the final corner saw the bikkies go elsewhere. 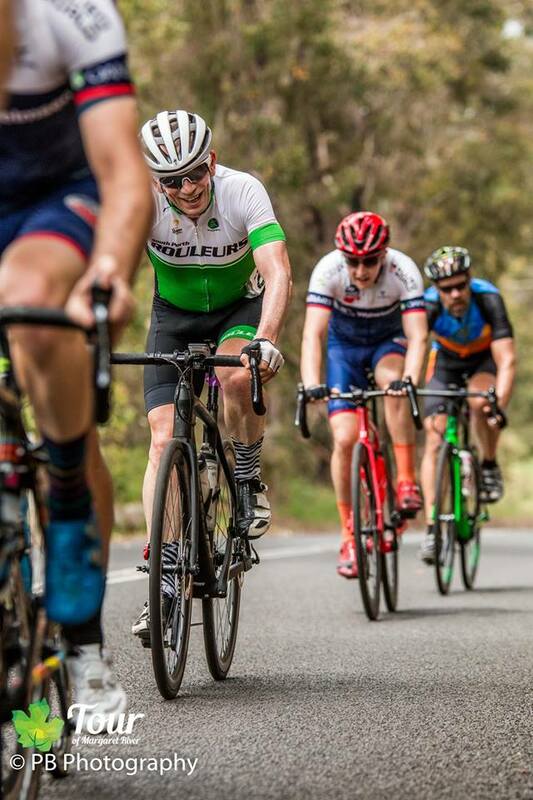 Men’s B grade was quite the mixed bag – young, experienced and in between having a crack. Rolling out was Bonner v1.0, The Italian Stallion, NowhereMan, Team Columbia and Thorman in Dome. Not a lot of info from out on the road, sadly. 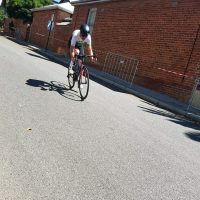 However, the approach to the final corner and into the short finish straight, it was Thorman rolling through in the first 3, with NowhereMan in there. But it was Team Columbia that kicked, with a clean line through the inside of the turn and up the left he nabbed a second on the line, Thorman holding for 3rd. The top 21 finished within 10 seconds. And a handy 10th went to Ol’ Mate, Stu Passmore. 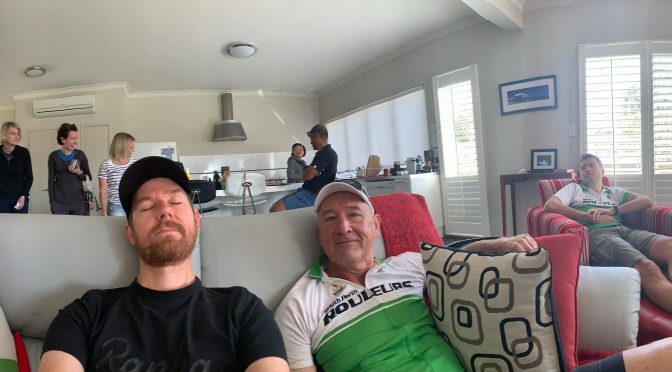 After wrangling the Passmore/Albany CC team, he was also our pub room neighbour, and a terrible guest to be stuck next to ……… just kidding. Nice work Stu. 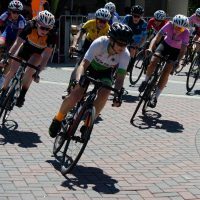 Womens C had Jonelle out again, and taking a 3rd place from a larger field than last nights’ crit. marginally behind Mascaro with a 2-minute gap to 3 and 4. Bex came home less than 9:30 mins later in her first (and possibly last for a while!!) 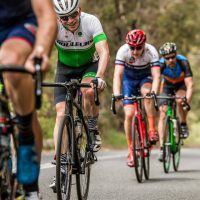 A grade race. Proud, humbled and VOCAL!!! Great work Rebecca! The podium would host Emily Mascaro, FRWL and V2.0 for 1-3. Really strong riding, Chix!! 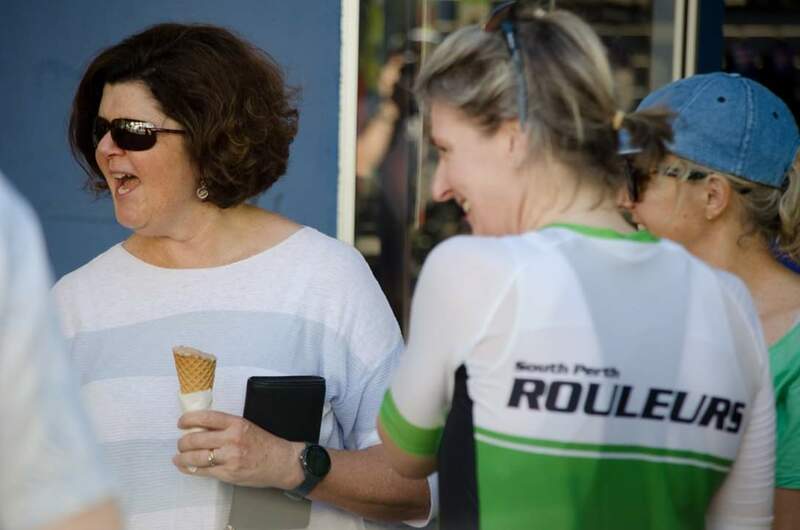 For the A grade women of SPR, there is a succession plan in progress, it would seem. 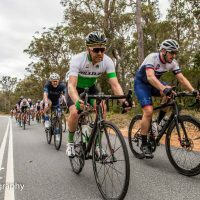 A grade men had a series of breaks, short attacks and three laps of speeeeed. For SPR we would see Dome clad Elar for 12th and a Velofit Threshold Merchant take 18th. 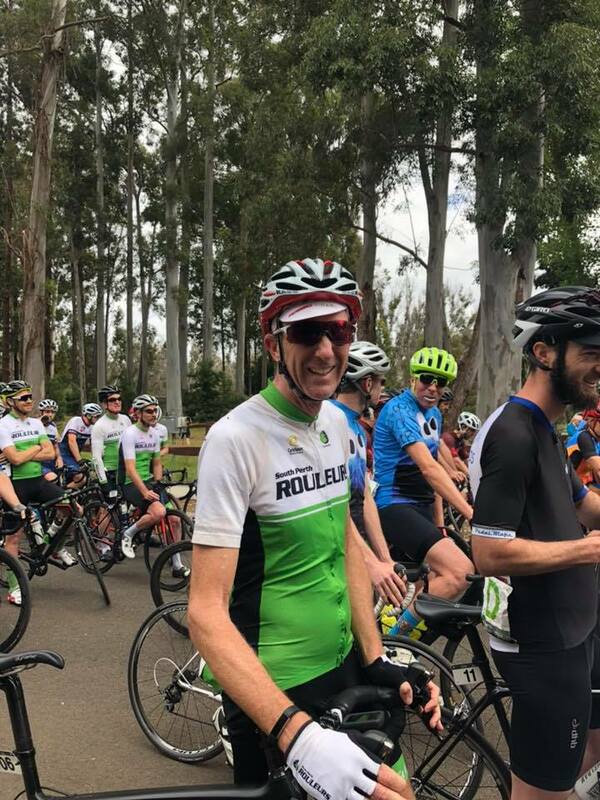 Both the Crit and the RR had Mr National Champ Freiby featuring, racing with “The Jersey” for Sunday’s Road Race. 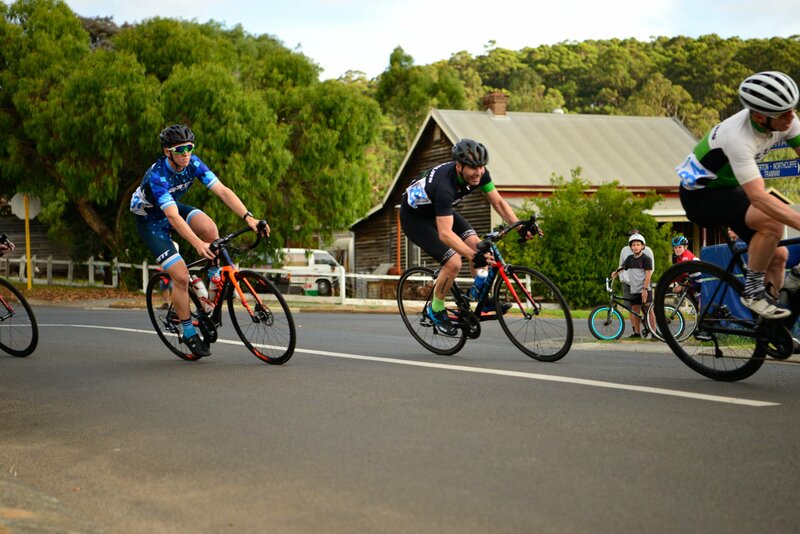 It’s quite gratifying getting passed at speed by our National Champ…..
Full Pemberton Classic Criterium results are published HERE, and the Road Race results are published HERE. There are a bunch of Event photos on FaceBook HERE, as well. At the Presentation Ceremony, there was a tinge of sadness in proceedings. 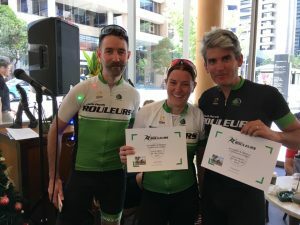 After a near miss last year and tough year this time around, the Pemberton Classic Committee told us this would be their last year staging the event in its’ current format. A combination of time and logistical difficulties have meant the local crew do not see the current format as sustainable. 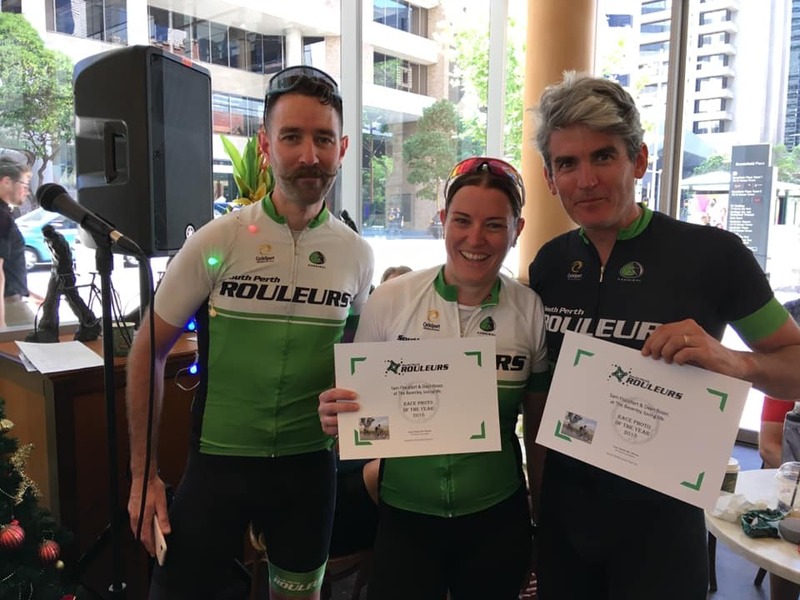 As Super Commissaire Ken said as the presentations: “Take how many hours you THINK organising an event like this takes, and then multiply by ten”. I can absolutely relate, and (warning – biased opinion piece coming here) the support that is expected, paid for and due doesn’t always amount to actual support outcomes. This event should NOT be allowed to slink away and disappear. As a Club we need to get behind them. What the Pemberton team have been able to do under extremely tough circumstances is extraordinary. They have the third highest prize pool of any race in WA. THIRD!!! 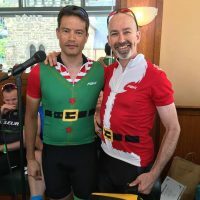 That comes from contributions from almost ALL of the local businesses (the presentations prove this, with just about every shop front in town named as a prize donator) and a series of local families offering up prize sponsorship. How is that for Community support? Let me answer that – the Community support is awesome. Just remember that the next time a call goes out to assist with pitching a Club tent, or requesting volunteer time. 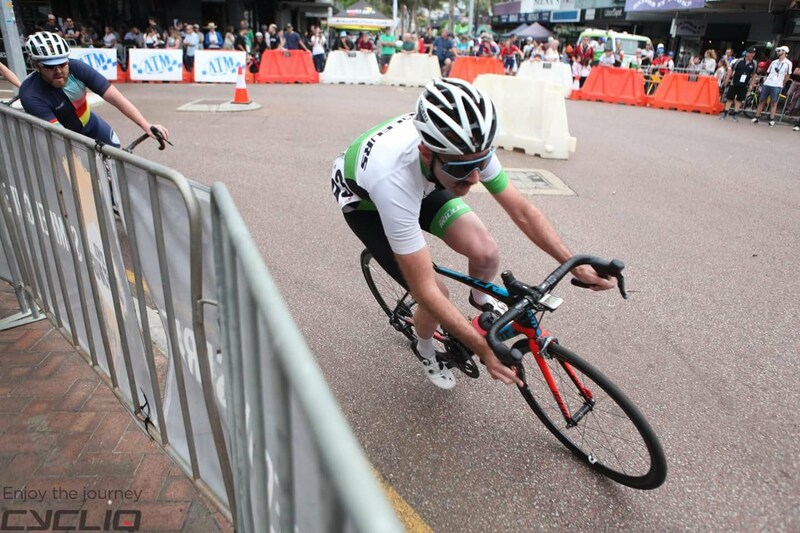 This weekend is the final round of The Ring Criterium Series, staged at Northbridge. 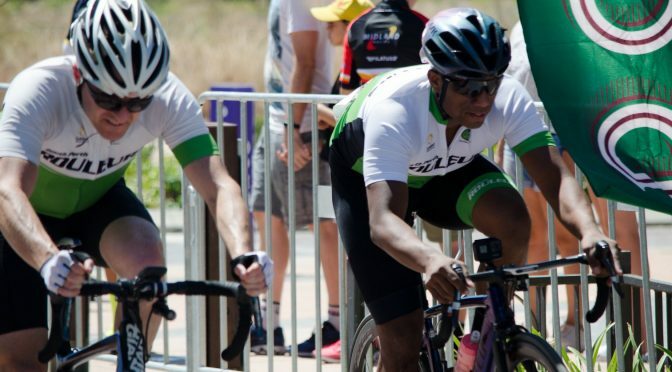 The action starts at 12:30 – bring your cowbells and get cheering for a big group of Green racing. 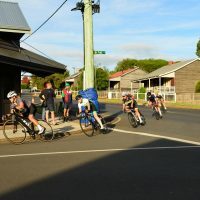 Women’s C Grade, and once again FDJ and Nancy (The Technician, in all endeavours – seeeeerious precision in everything, people) rolled out onto course with a field of 12. Awesome numbers indeed. It was The Kids who got away with a small break in the second half. Kids that are half or a third of our SPRouleurs…… ouch. With nothing more than a few wheels gap required, a small split would grow quickly. FDJ and Technician finished 40 and 60 seconds off the winners for 6th and 8th places respectively – and respectfully. Oh yes, this was The Bizness. On this course, in this heat and with seriously strong whippet-up-and-comers to race against, Green more than held it’s own. Ring those cowbells. RING-A-DING DING DING! Men’s D grade and Poodle copped and absolute sweat soaked spanking. With (again!!) a long list of up-and-comers, “Crit with big hill” is not what Poods ordered and not what Poods is best at. I mean, the pub is at the bottom of the hill. You’ve just removed the motivation to climb! 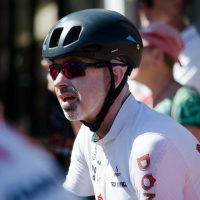 Racing alongside Mr 1-2-3 and Dave Croft, Poods was last to finish on the lead lap in 19th place, and was within 16 seconds of the young victor – valiant as only Poods can be. 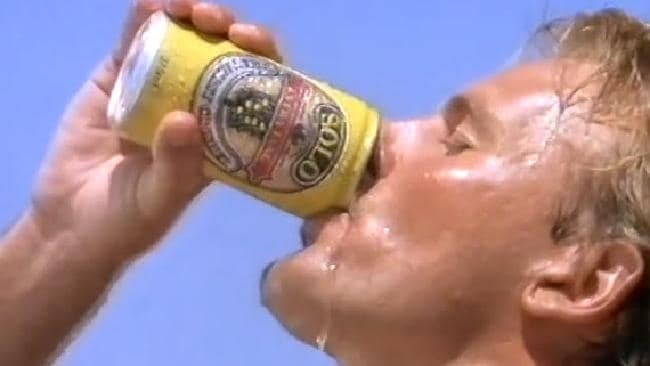 Before retiring to a nice, cold, carbonated beverage. Mens’s A grade was a Monster Class. And that’s not auto-correct. Henry Pennell broke early, but once he was absorbed back in the bunch, and fresh new hell was unleashed. And that hell started with Cam Meyer. It was on. 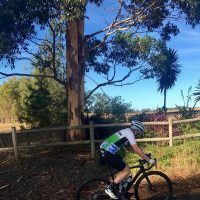 Cam led solo for a bunch of laps, lapping consistently at 43km/hr. So quick we struggled to cheer and then have a sip of beer before he came past again. Then it was Kalma, then Meyer, Kalma AND Freiberg. Monster Class, I say. The three smashed the field to pieces for 20 odd laps before Kalma jumped and took the sprint win. Exciting? Yup. Teneal again came out swinging (figuratively – not literally) for A Women. A field including Dome, Mascaro, some Hitter from the Melb-Warny (OK, so seriously, she took 4th there), as well as a Bonner and a Tucknott. Looking at the MyLaps results, Teneal lead the race for 15 of 29 laps and sat 2nd for every other lap. Teneal motored home the sprint from the final corner with a clear gap to 2nd. Dominance. She stays in yellow another week. Only 5 of the Chix finished on the lead lap, including Half-a-Banabi and Bonner V2.0. 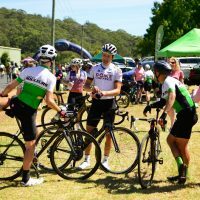 Men’s C Grade, or as I like to call it, Life Inside the Peloton. Oh, that’s taken. Anyway’s, 38 starters on a tight looking course, varied cornering abilities would make an interesting race. AfterBurner and Mo were stupidly placed at the rear of the pack for the start – with visibility of anything sketchy ahead, but no way of avoiding working harder to stay on. 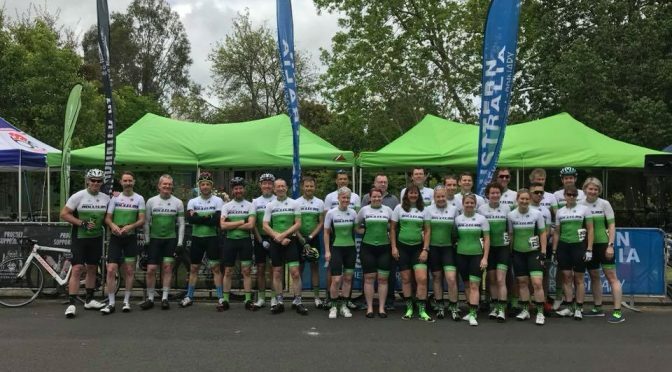 SPR in C had series leader Mark Claydon, AfterBurner, Raf, Ben, NumbersMan, Pete Seizovic, T-BoSuperCoach, Mo amongst others Green and not (BTW, it’s Green for the win, in case you’re considering other colours……). Missing the jump, it was a fast pace straight off the bat, with the first 10 laps over 38km/hr. Laps 4, 6, 10 and 12 claimed near all the SPRouleurs. The Fast and the Furious……… Furious-ly chasing back on, that is. Only 15 of 38 finished, Mo the last one lapped on the bell lap. Although the single rider frame opportunities for pics whilst off the back…….. nah, not worth it. 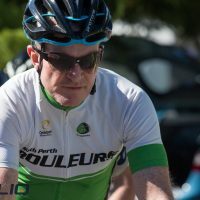 The win was taken convincingly by Mark Claydon, and he retains the Series Lead with an unbeatable break on series points. 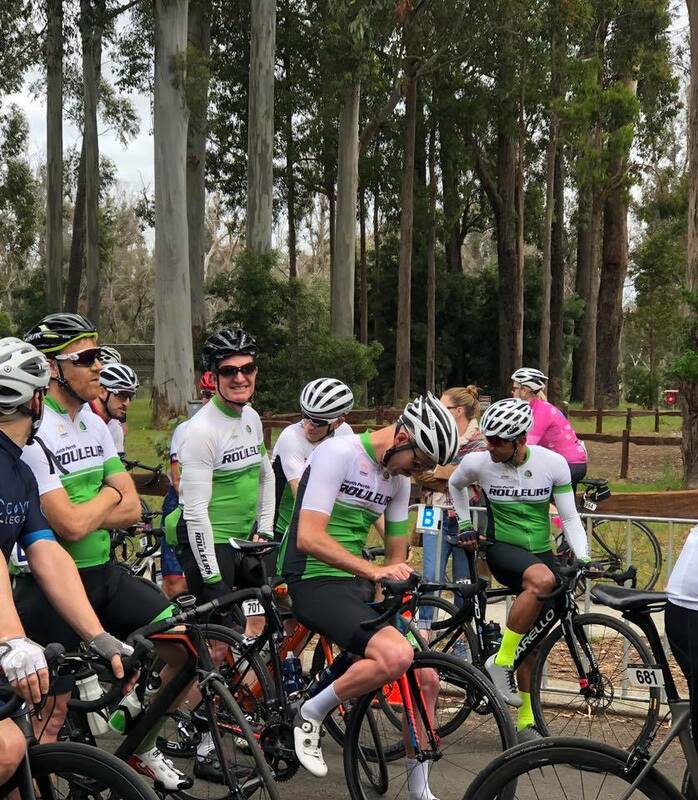 Men’s B was a blistering pace, but with nought for SPR green in the pack and a hard day out for Dome, we had nothing to show except Ballam’s face o’ pain. And as good as it was, it ain’t for the kids to see. 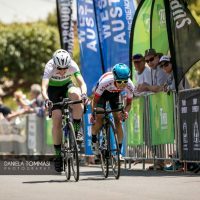 Women’s B was again one to watch – fully biased, opinion based piece, right here. Librarian, More Moore, Flockers, Bex ……… and a Wiggo. Librarian and Bex made an early move and split the group, becoming a 7, then 6, then 5 chick race. 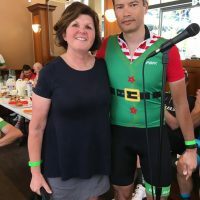 Arriving with baked goods to share with SPR, and despite moving along 3 teen kids out of school, Librarian’s work was never done – charging up the start-finish slope every time Bex wasn’t. 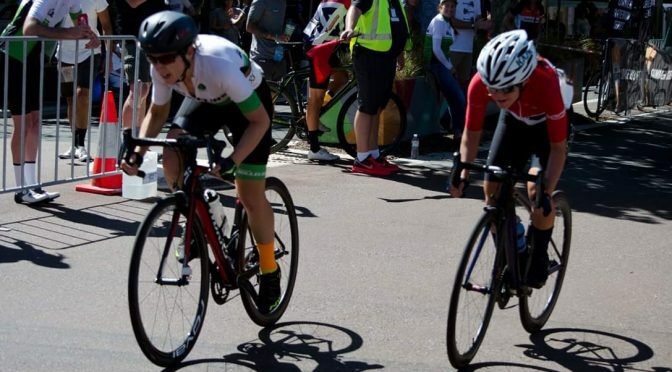 An electric attack from Wiggo was short-lived, realising Bex and Lib’s were patient and there for the long haul of a short race. Having been gapped, throughout the chase Flockers lapped consistent times to the finish for a tough fought day out. Final lap and Wiggo went again, Librarian in 3rd, Bex for 5th. Mrs missed the podium, but won a Prime. Awesome. Unfortunately, she had no idea what a Prime was and has since forfeited the voucher to Mo (this is on the internet, so it must be true). Great teamwork , and well finished off, Ness. All detailed results are HERE. 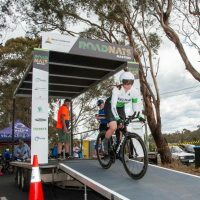 Next up is the Pemberton Classic over the long weekend, then the final round of The Ring at Northbridge. 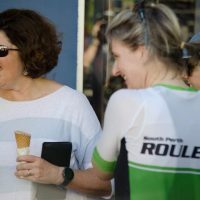 We open this race report with the breaking news of a Consumer warning advice message – there’s another Wiggins on the way. U13 Fay Wiggo placed 2nd. There are more Wiggins Wins in the future. You have been warned. Northam, Land of an amazing pub. Of a Visitors Centre cafe that does one of the best coffees healthy breakfasts we’ve had in regional Australia. And land of some wide, open roads primed for Crit-ting. Cue the music…………. 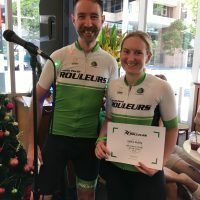 Women’s C grade, and our perennial race report inclusion (so it seems!) FDJ (our Faye, not the team of Frenchies) romped home with a 5th place, with Nancy close by in 6th. 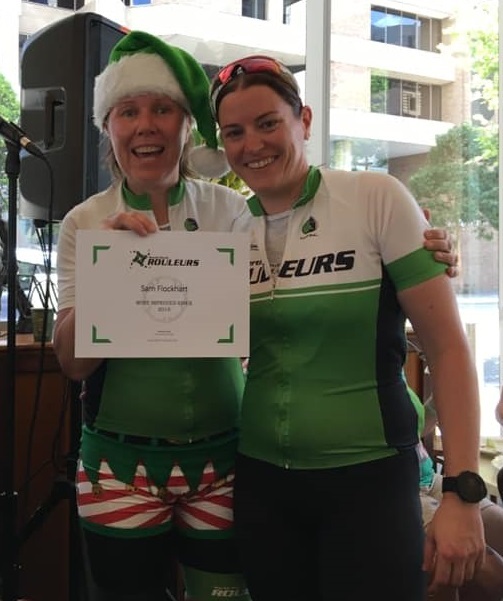 For some context, Faye and Nancy’s Best lap speed of 36.5km/hr was up there with previous B grades, with the winner over 37km/hr! Definitely a fast finishing bunch. 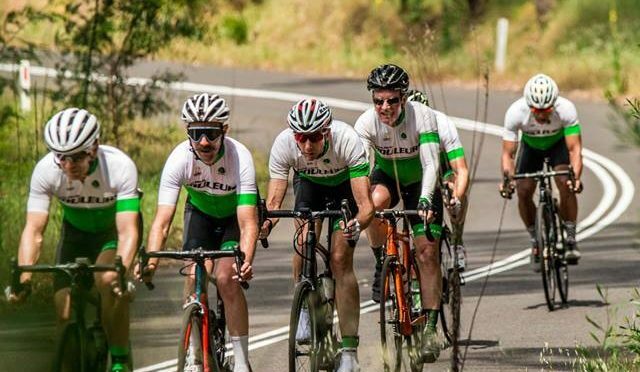 Token nickname time, back in the grade where all this malarkey began – C grade Men. 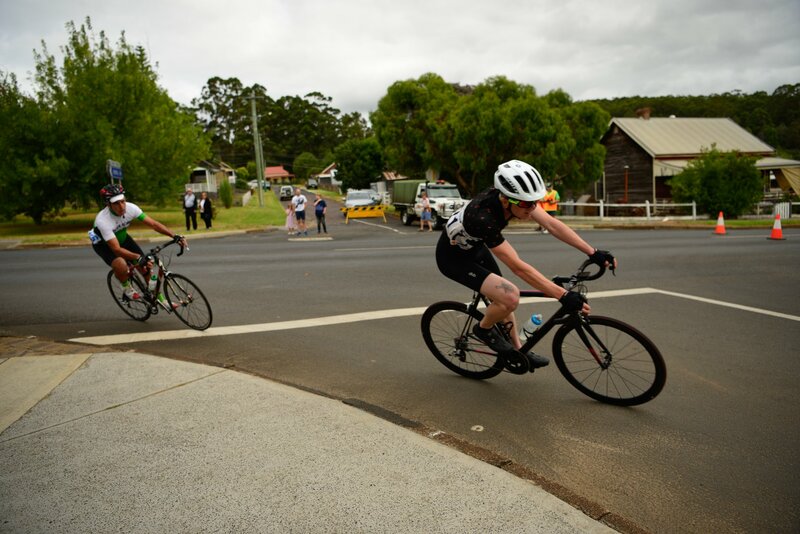 The boys cracked nearly a 45km/hr best lap speed – there’s some serious speed to be had on this course, it seems. 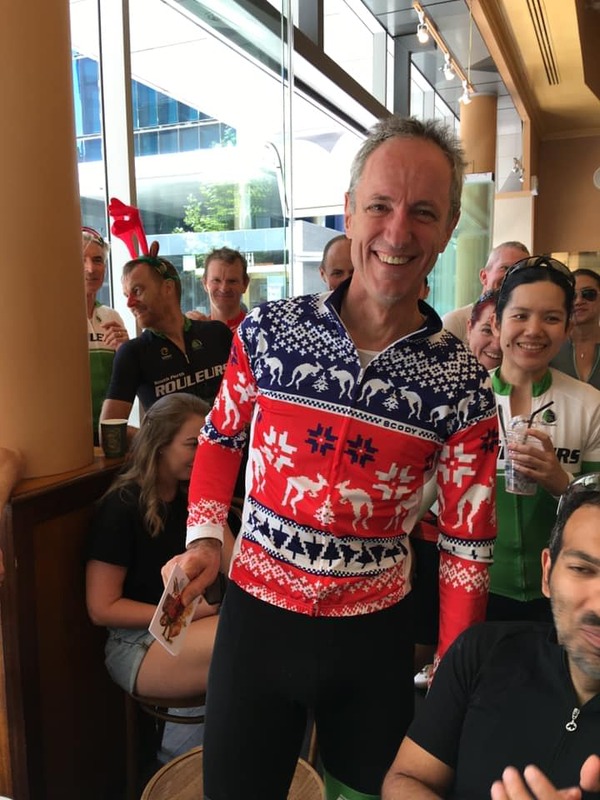 This round saw another podium for Mark Claydon with a 2nd – where’s your jersey?! 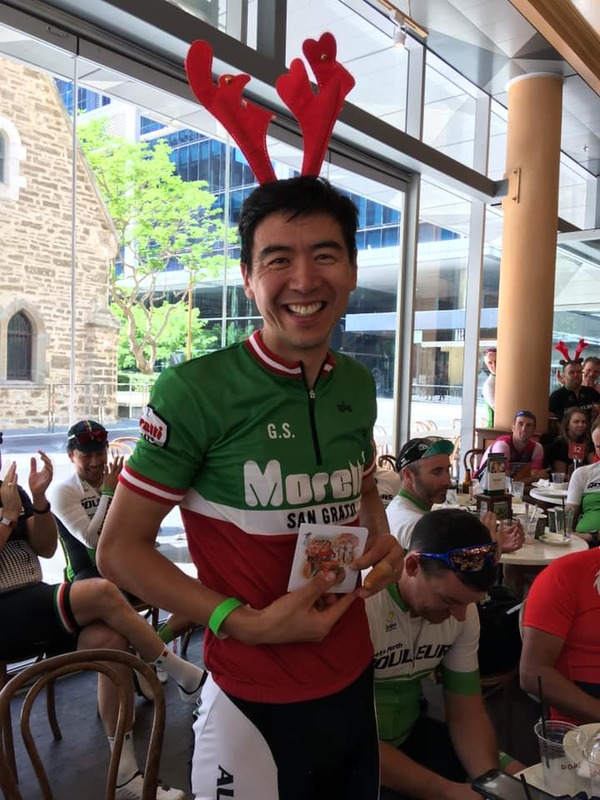 (I guess it’s OK if you’re in the Series Leaders jersey, to be fair!). 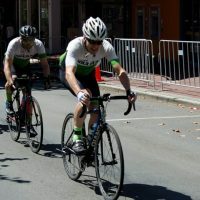 Other SPRouleurs were Ben Fairclough in 14th, with NumbersMan and SuperCoach a way back. 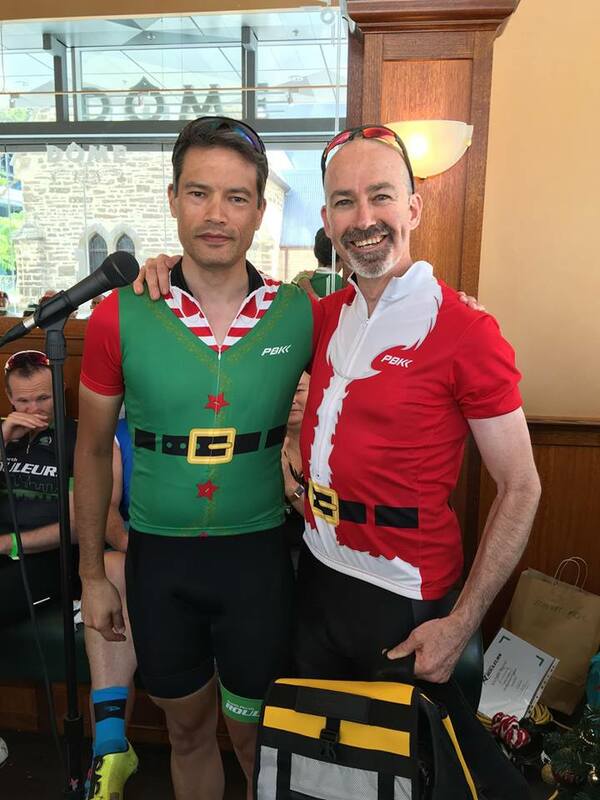 Mens B Grade provided all the pain faces – thank you Rumpelstiltskin and Woj. The rest of those boys need to pick it up. Best place for SPR was Team Columbia in 7th. Dome finished with Thorman, Woj and Half-a-Banabi wincing from 11th down. Get that crew a double espresso, pronto. 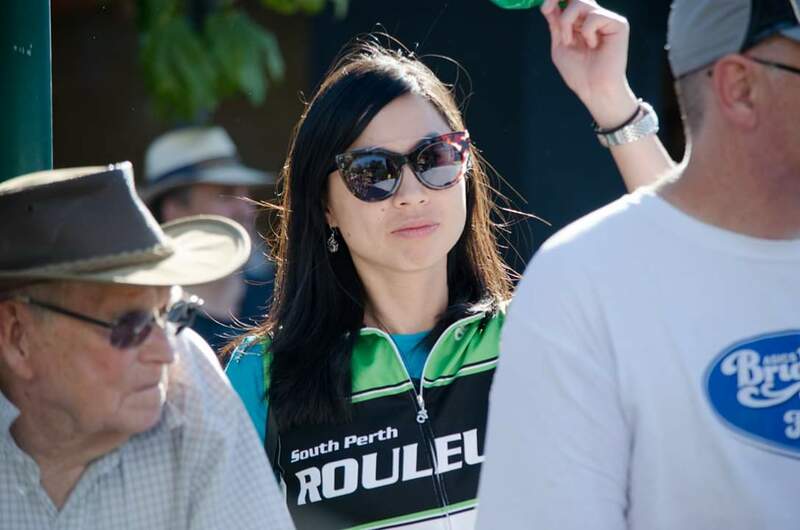 Women’s B grade – the seriously spectator ready grade – gave up another mixed bag of possible place options. 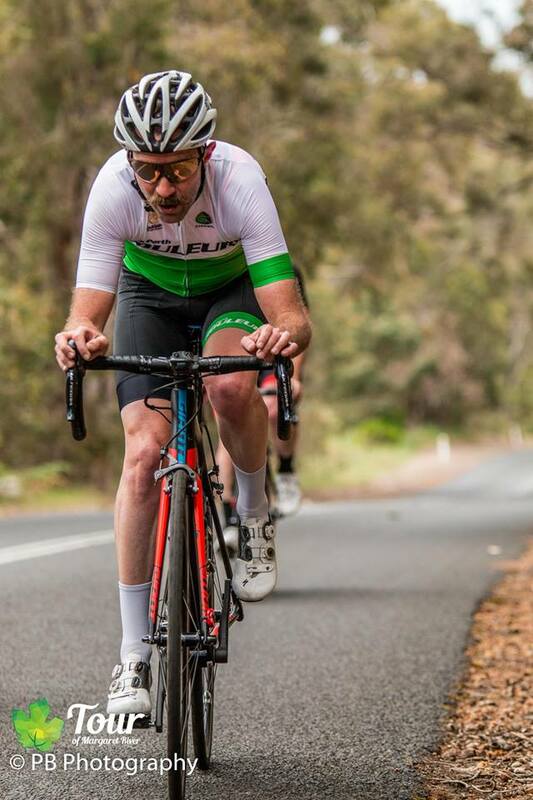 Heavily contested, this week it was again E Wiggo for the win, suiting those young track legs in a flying finish. For SPR, More Moore took 2nd with a teeny tiny margin between. And The Librarian for 4th AGAIN! If anyone could make 4th the new black, we knew it was Ness. 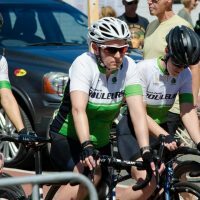 Flockers, with no excuses to offer, wasn’t on the start line. Oooowwwhhh – that’ll come back to haunt me. Men’s A again hosted the PEOPLE’s CHAMP – Freiby*! (* – People’s Champ, in that I can’t think of anyone that hasn’t got a photo with him in the National Champs jersey). This week was the lone SPRouler of Elar, one half of Check 1-2, representing and finishing a creditable 10th for Dome. When will we see the SuperGroup of Check 1-2 reunited on stage? Craig, Elar – what will it take? A GoFundMe? A Change.Org petition? Ahhh, those were the glory days…. 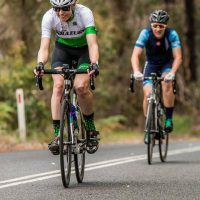 Women’s A grade showed where this season’s peak form seems to be remaining. 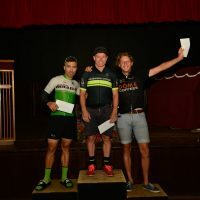 It was a sneaky sprint up the left that gave D Wiggins the win with Teneal Attard in Chaotic livery with ANOTHER podium and 2nd place, retaining the series leaders jersey. Bonner V2.0 nabbed a 4th place. There were a few notable non-starters, whom shall be ribbed all week for no reason other than my own amusement….;). Half a Banabi – I’ll show you sneaky yet….. In the Club based Series, points stand with MCC leading on 116, Peel on 76 and and SPR on 59 points. Watch this space though. This week is Subiaco. Roads are closed. The travel there is less than 70km (yay!!!). It has a hill. Hmmmmmm. Rumour has it there may be a cowbell or two. Or eleven. 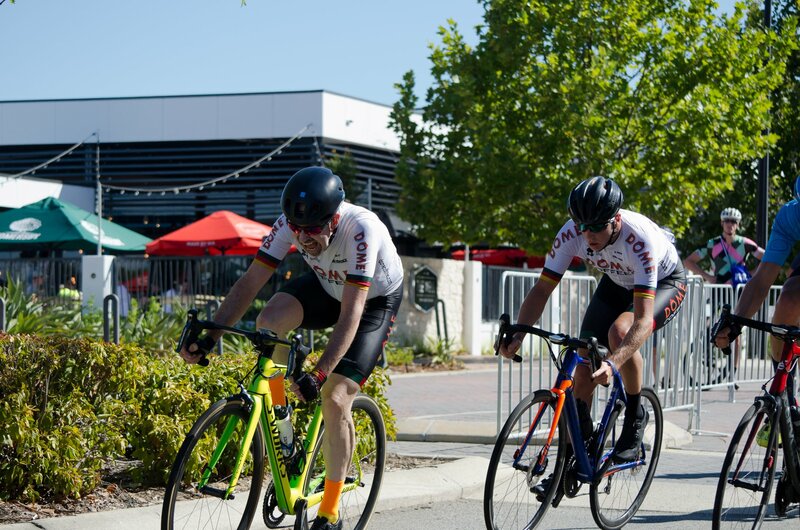 The Ring kicked off the season with a round on a new course in Mandurah. 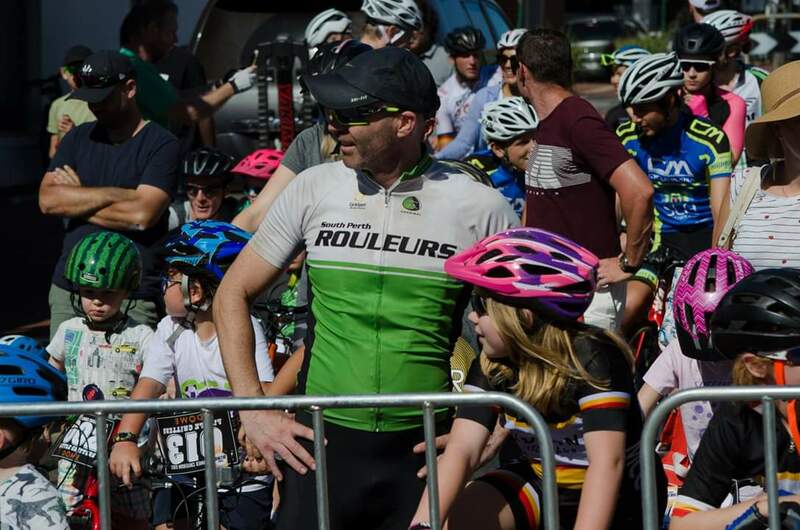 The first round of the year had a smaller field with SPR making up a large proportion of wheels. A hotdog format with a few roundabouts thrown in, it was likely to be a tough day out. 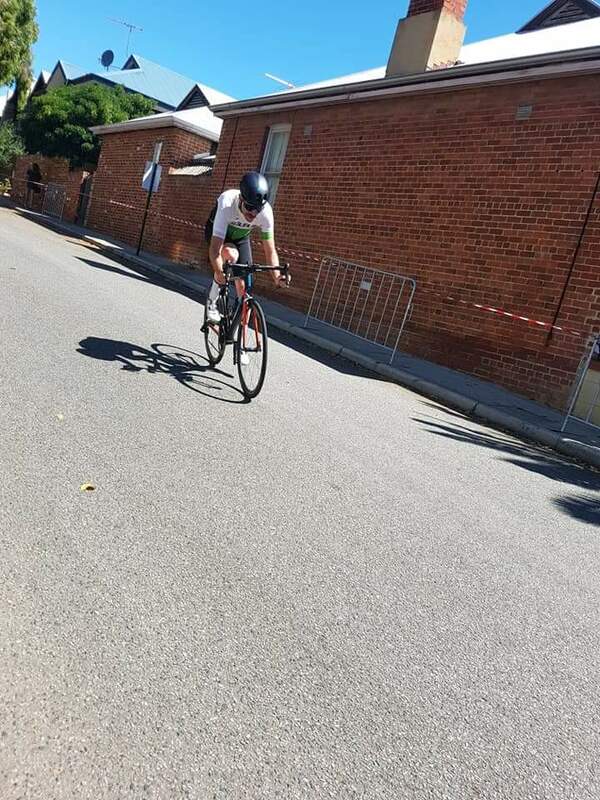 Men’s D grade saw Andrew “Big Willie” Williams time trialley styley to finish. 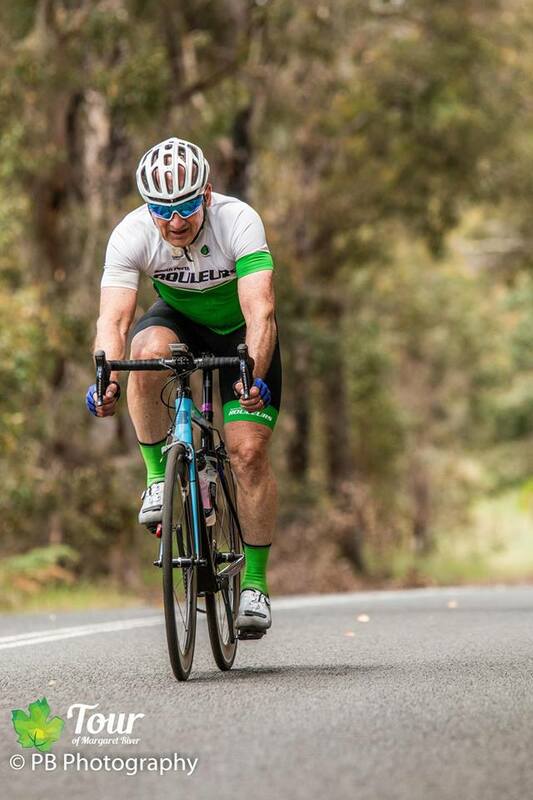 Not bad for a bloke that before R-Adelaide hadn’t ridden up a hill since Varese in September. 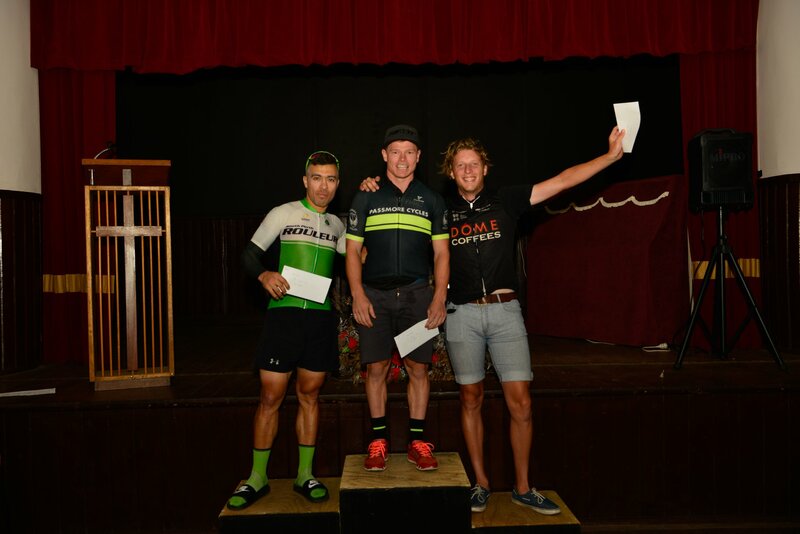 Men’s C had SPR field a few, with newbie Mark Claydon nabbing a podium 3rd in his first outing in race mode. 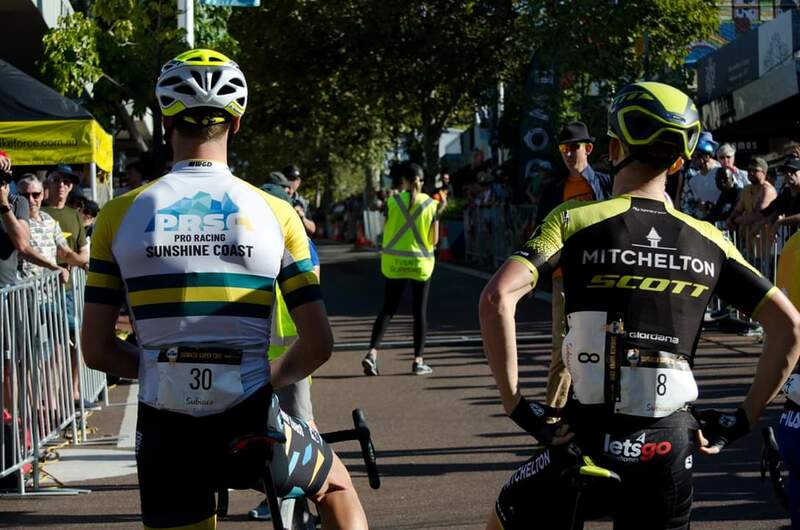 T-Bo SuperCoach, Numbers Man and B Fairclough rounding out the finishers, but not the podium. 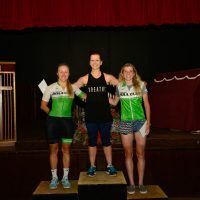 Women’s B too had a host of usual suspects – The Librarian, More Moore and Flockers, FlockFart, FlockingFast (hang on, we’re confusing ourselves) representing. Librarian was one place late returning and collected a fourth place for the day – nothing by a half a second in it, and less to More Moore in 5th. 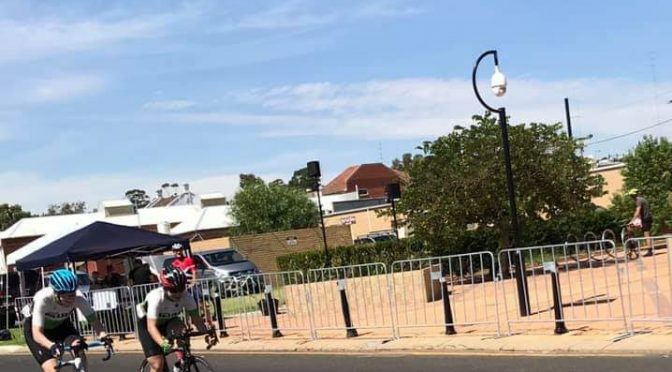 For the record, a New Wiggo is in B-Grade Town and Emily took the win. Men’s B on paper looked like a true Young Vs Old (all offense intended). 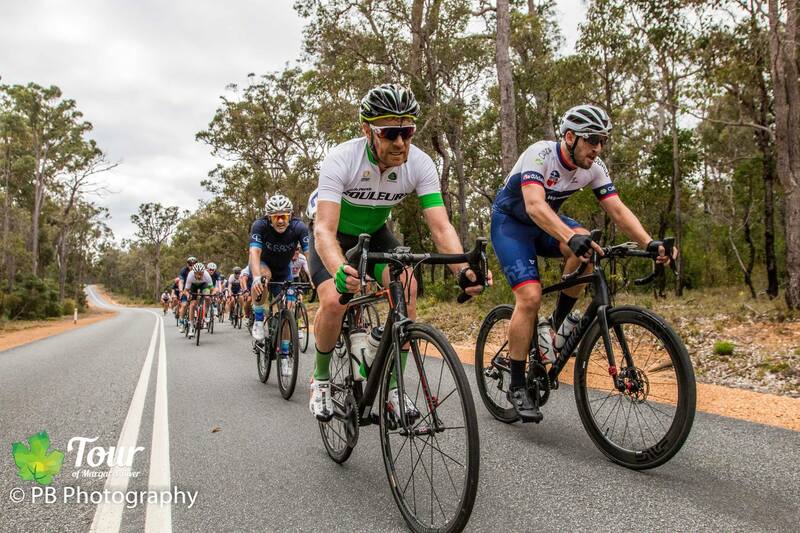 Ballam had a belter, attacking and hanging onto the fast lead bunch to the finish, Team Columbia close behind. This round was taken by Young, but with a Glasby and a Depiazzi in there too, there’s more kick from the Good Ol’ Boys yet. To B continued. Men’s A looked like a slug-fest, with the best SPR-related finish a 3rd to Dome’s Tim Sellar – a far stretch! Women’s A too boasted a number of Young ‘Uns. The hotdog format suited a hitter with a KICK! And so it was that a Chaotic finish (Chapeau on the wordplay!) 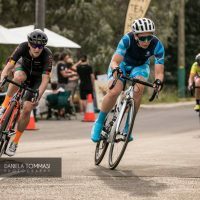 had Teneal Attard take the win to a coupla Young ‘Uns. An Attard sambo, flanked by two Haines’. ½ a BaNabi a mere 0.01 seconds to 4th. A finish tighter than a frogs bum. Not to mention a Wiggo looming large in A grade. Hmmm. 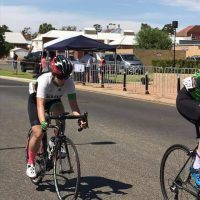 Last Sunday the Ring Series returned to Wellard. As it was for last season, it’s a tough little circuit with a small but trying climb. The conditions were hot, so firstly congratulations to all of the SPR team that turned up to race. 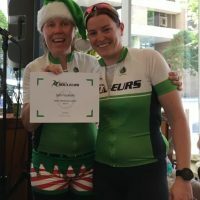 The women’s C grade was the starting block to a great day with Nancy and Faye leading the charge of what looked at times like supervising Day Care. How quick are these up and coming kids?!?! A good turn out with 12 starters ended with the day’s first SPR success story – Faye riding a superb race to take 3rd. A top race. Watch this space SPRouleurs. 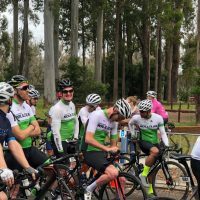 The men’s C grade had a large field of SPR riders but in an early crash, all but two SPR riders caught behind. 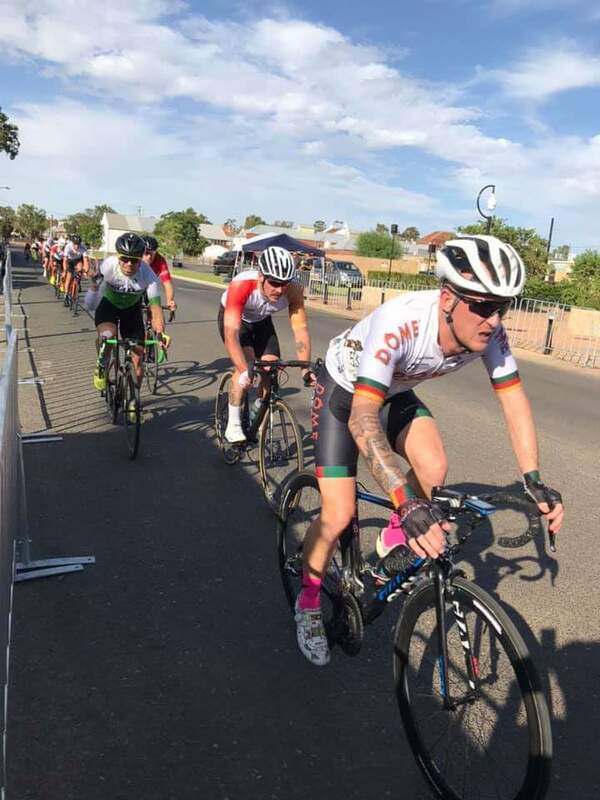 Day done – they all lost time and never managed to catch the leading riders. Luckily none were hurt. 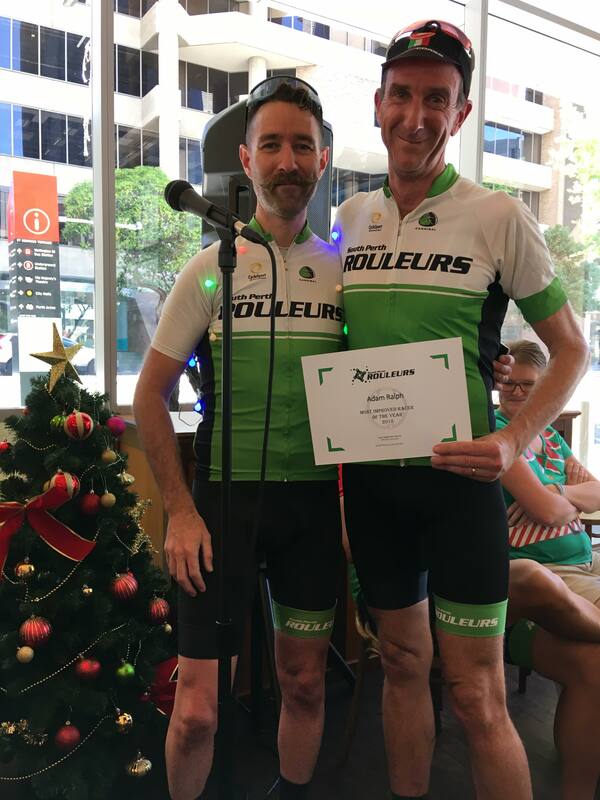 At the front of the race Ben Fairclough and Mark Claydon held the SPR banner, with Mark launching a rocket to lead the field up the final straight and claim his first victory in only his second race – B grade calling? He now wears the yellow series jersey for the next round. 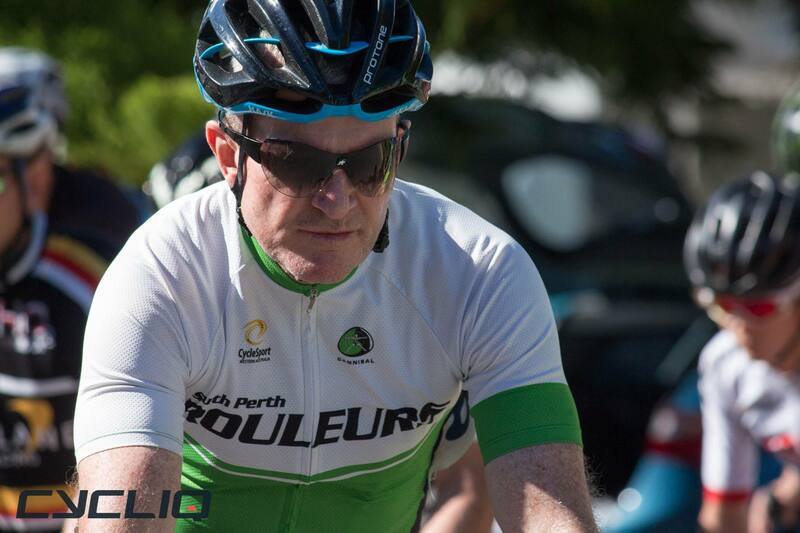 T-Bo SuperCoach finished 20-odd seconds back and NumbersMan and Raf DNF-d behind the crash. AfterBurner and Jedsman, were allegedly at the scene, but not seen racing…. curious. Get. Off. The. Front. Photo: Jedsman. 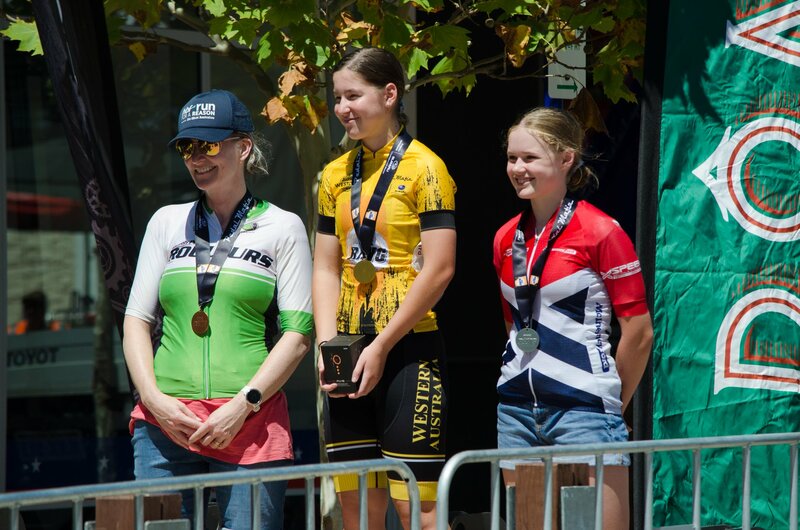 The women’s B grade had strong performances from Vanessa Johnson, Kirsty More Moore and Sam FlockingFast. Kirsty fired the AfterBurners (see what we did there?) to claim the Prime Sprint prize. 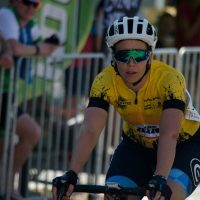 Vanessa made several attacks up the hill – never listening to the advice of “Get Off The Front”. I mean, why would you – in the start finish straight where the cameras are (?!?!?!). Shedding riders in the process, narrowing the field but ultimately missing a podium whilst making a proper show of it. Sam, joining B’s this season kicks on AGAIN and ……. A great performance from all three. Kirsty took 5th, but it was Lawler, Wiggo, Richards for the steps. 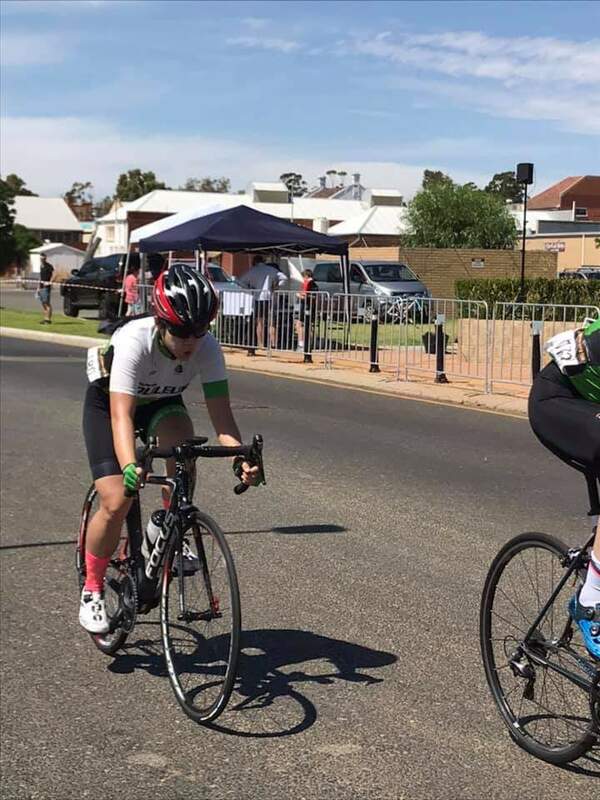 Emily Wiggins now smashing B grade…. Just when we thought it was safe from Danica stepping up to A’s. Hmph. Hit ’em with the ol’ One-Two. Photo: Jedsman. 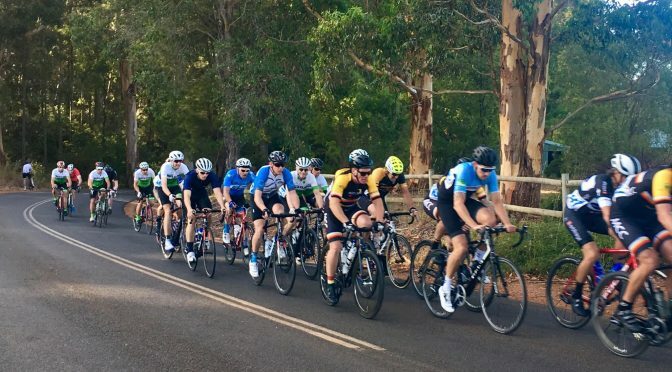 The men’s B grade had a large field of 35 and saw a serious crash, with 8 riders down including our own Team Columbia. Suffering cuts and bruises but luckily nothing worse to fight another day. Ballam, rather than looking FOR or a crash (Rumpelstiltskin, anyone?) chose to use evasive skills to avoid one. 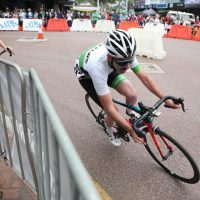 Nick Finch pushed his limits, made the field hurt and finished close to the front but could not hold on for a place. Ben Thorman, seemingly always on the front and must have pulled the field along for most of the race, held on for 3rd. Not bad after hills ride this morning, but probably could have won with fresh legs ;). Blue by team, Green by membership, Yellow by achievement. I prefer Green, just quietly! Photo: Jedsman. 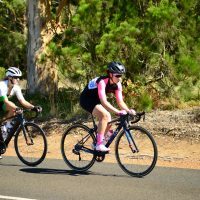 Women’s A grade saw a melting pot of the new bunch and some seasoned Hitters mixing it up. Half of BaNabi had to chase the field after a dropped chain on the first lap (Ballam is a rubbish mechanic, after all). 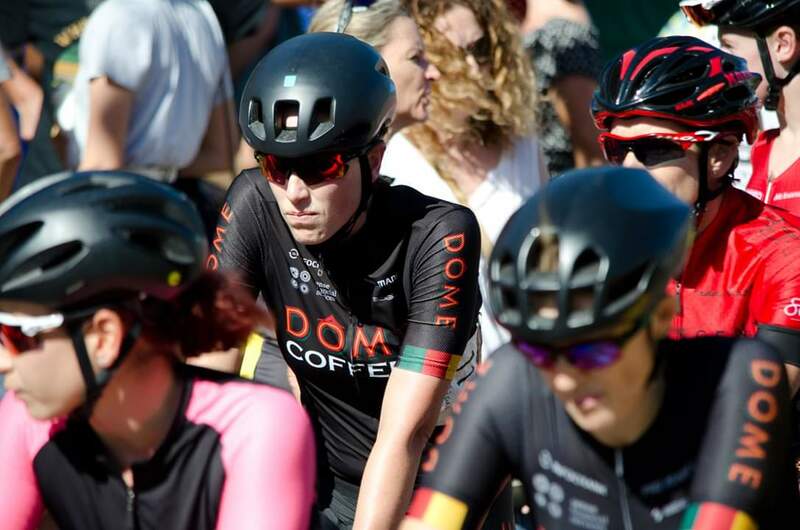 The Dome girls competed well with M&M working tirelessly on the front. Bonner V2.0 too had a strong race, recovering to an eventual 4th after changing a broken wheel mid-race. 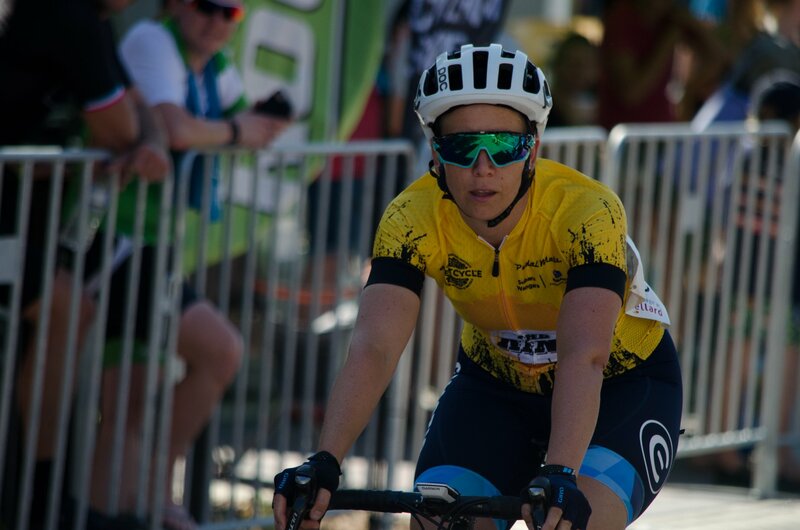 It was Chaotic Energy’s Teneal Attard, from the front, producing a final attack up the finishing straight to hold off the field for her second Ring Series win and retains the yellow leader’s jersey. The results would show Attard, D Wiggo, Mascaro for the podium. Danica W in A’s and straight on the results board. Help us. Hydration is everything. Photo: Jedsman. 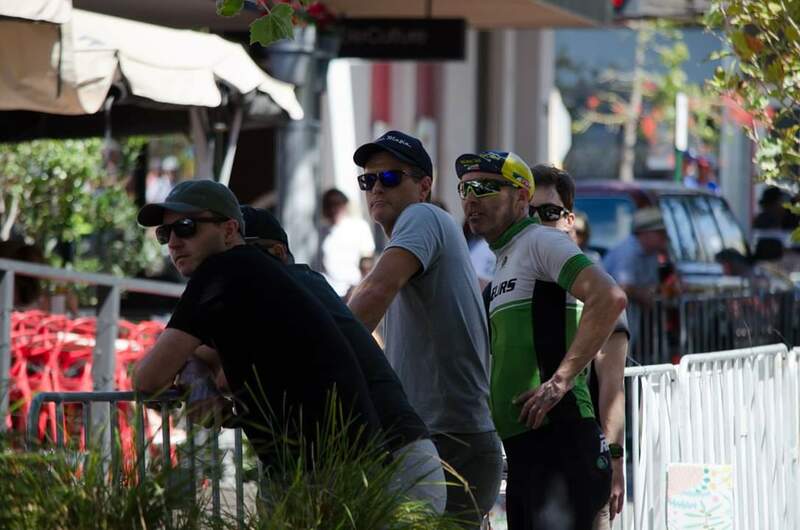 The men’s A was last to race and saw a number of no-Green kitted blokes out there. The Dome Team was well represented but no match on the day. 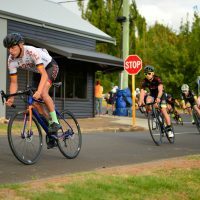 In a stellar field no one was able to hold off local PDCC boy and current NRS racer Theo Yates (and his Mo), ANOTHER Wiggins and Lanigan. 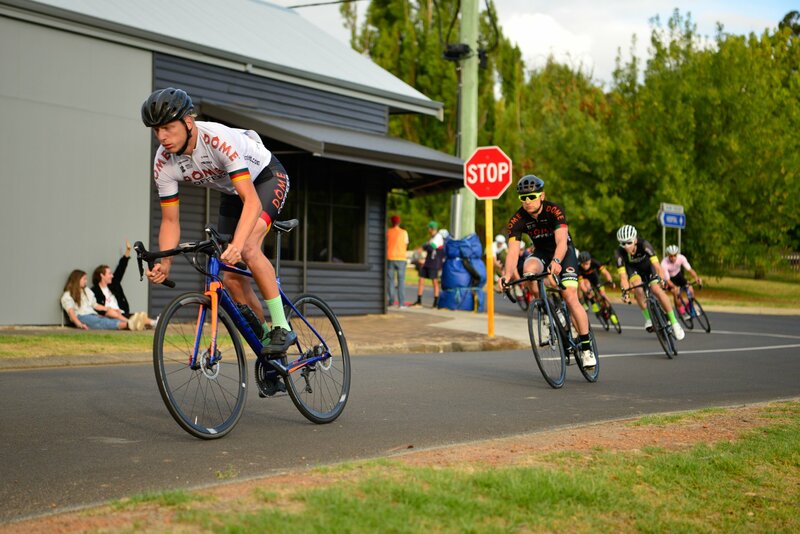 The seasoned Dome sprinters drafted, like old pros, behind the newbie….. Photo: Jedsman. All up a great day’s racing by all. And an even better tent set up from our VP, DrJ. Great pics from the day by David Menarry, and a lot of words from Steve Burns – more from him to come. Next up for The Ring – Northam on SATURDAY afternoon. Not Sunday! Thank you to everyone who participated and nominated our club members in this year’s annual awards. Approximately 60 people were nominated and below you can see the reasons why. We are very proud to have each and every one of you in our club! The winners of the awards were selected by a panel based on the number and nature of the nominations. The list of names below is a combination nominations listed in alphabetically order. 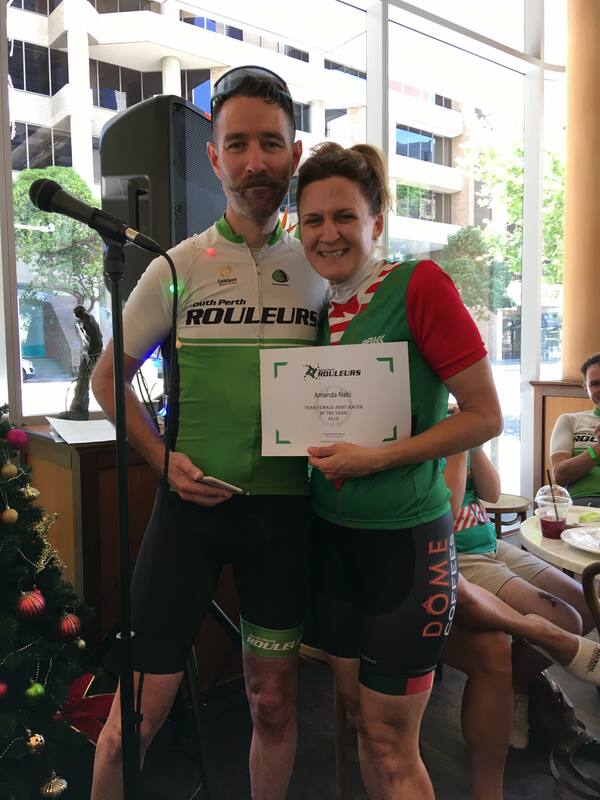 Most improved rider – a rider who over the last year has made the greatest improvements in ability and skill. Greg, much improved and well loved. 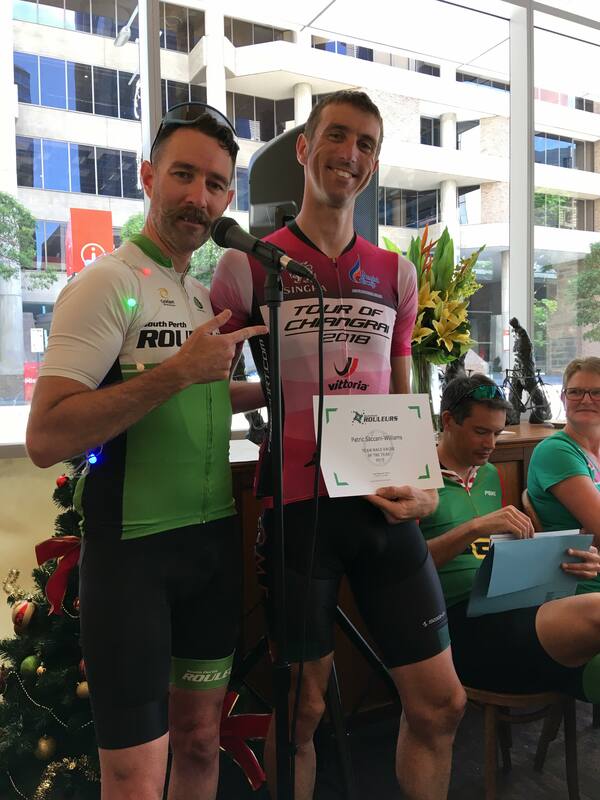 Most inspirational rider: someone who has influenced you through their deeds or helped to motivate you to achieve more in cycling than you thought you could. 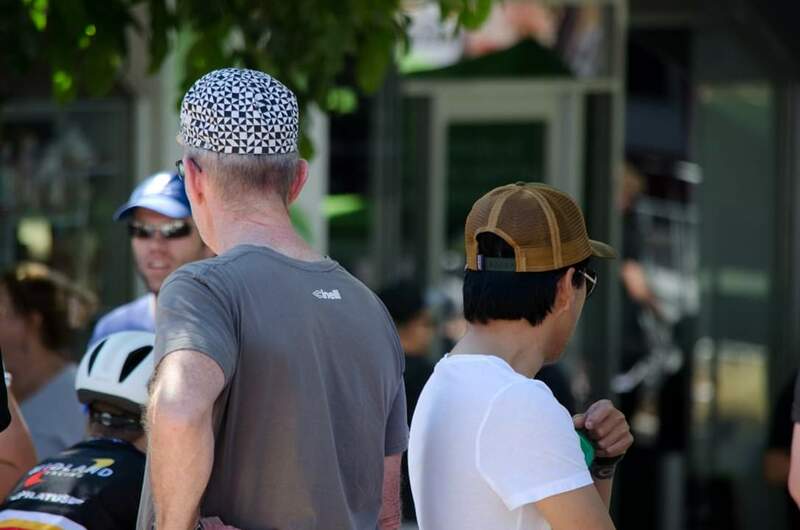 Good Samaritan/s: someone who has taken an opportunity to help, on the spur of the moment, another cyclist in need. These Blokes. Trust us – we’re cyclists. 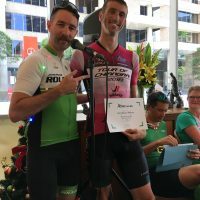 Epic equipment or moment award: something that sticks in your mind about a rider and/or their bike/gear/club ride/race that was so unusual, be that good or bad. Bonner. Mucho amore. Tears ensued all around. 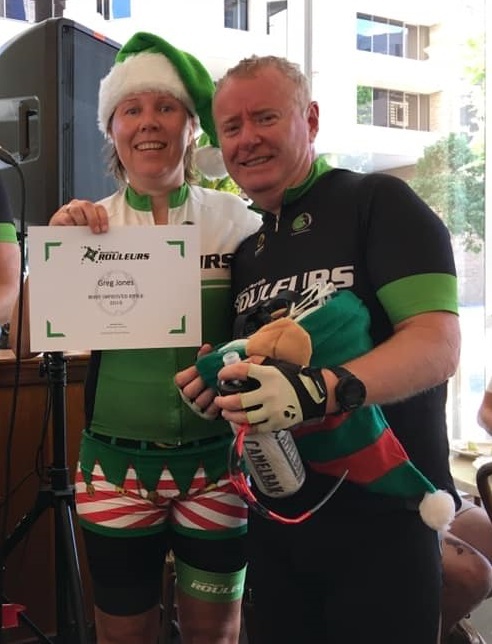 Michelle Bonner: For initiating full medical response with CPR to resuscitate and revive Greg Jones after an episode out on an SPR ride. 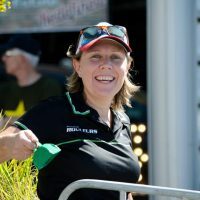 Vanessa Johnson: For continuing to race at WCMCC after witnessing husband and VP Dr J in several pieces on the roadside post-race crash. For another four laps. Laughs, haha banter…. Adam Ralph, Amanda Nabi, Andrew Ballam, Steve Burns, Tim Hopkins. For a forlorn image of Sam Flockhart and Dean Roser racing The Beverley in “marginal” conditions. 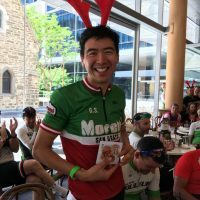 Peter Mah for his countless selfies while racing world champs and Seven. Rafael Fernandez for his SPR ride videos on Facebook. Mark De Castro. Appalling. A jersey so bad, it’s great. Peter Lander. Longest stripey legs going around! 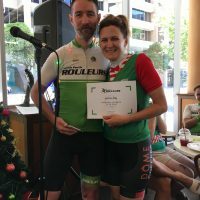 This year we are awarding an SPR kit and Team (non-SPR) kit awards for Women and Men. But firstly some Honourable Mentions for those that should be recognised for efforts AND actual achievement. 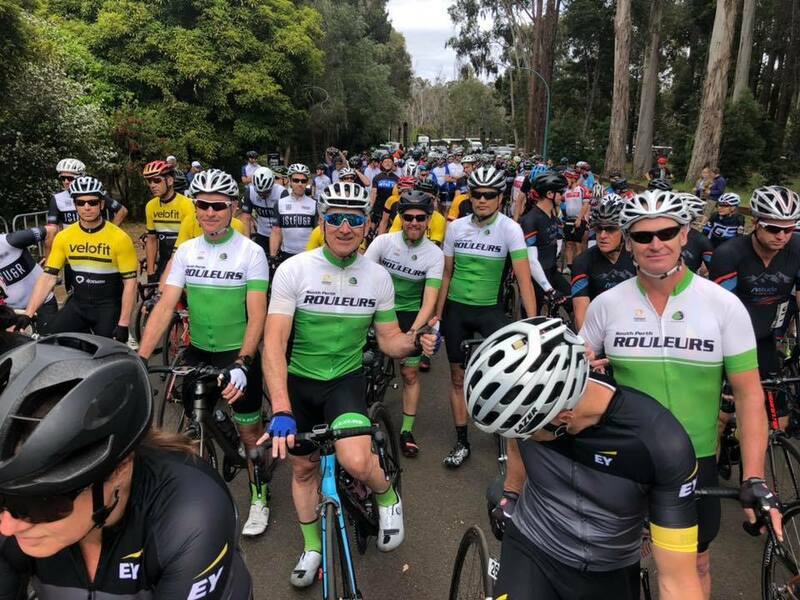 In the Mens, Masters WCMCC racing saw regular big numbers from SPR, largely from The Ring Leader recruiting all and sundry Steve Burns – outstanding work! 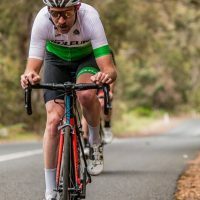 Among those racing with results through the year were Tomasz Wolcyk winning the Element Series B grade, Craig Denham performing as part of Check 1-2 through the Ring Series, Adam Ralph, David Menarry, Ross Boaden, Tim Hopkins, Pete Seizovic all taking results in WCMCC, and Mike Morris taking the win at Peel Classic C grade. 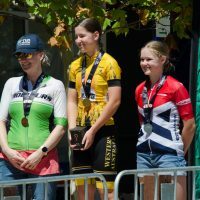 From the Women, Sam Flockart at Masters Nats, Corrie Johnstone’s A grade consistency, Vanessa Johnson, Laurensia Rosana, and without bias Rebecca Kelly (who forbid me naming her) who placed second in the Element series for B grade. 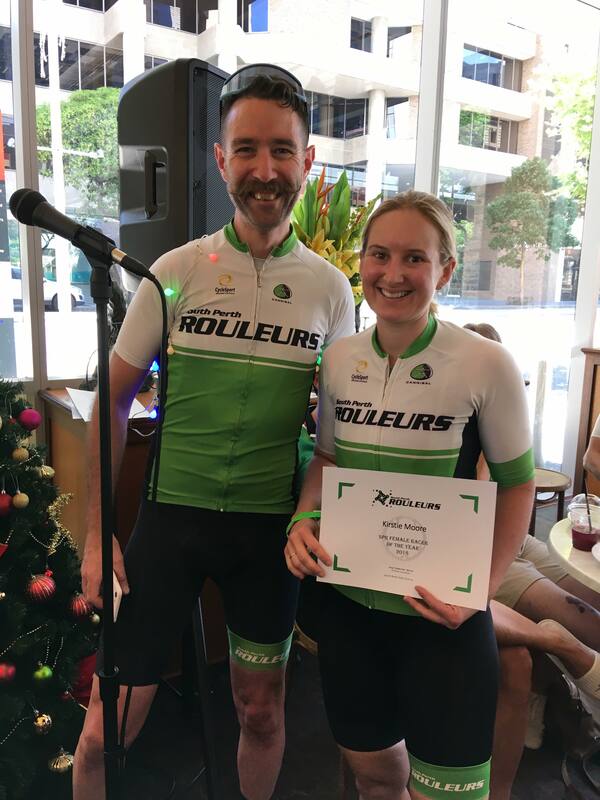 SPR Women’s Racer of the Year – Kirstie Moore. Kirstie Moore. 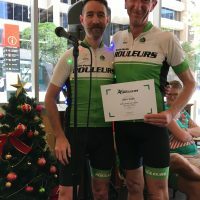 C grade series won last year, B grade series win this year. Where next? 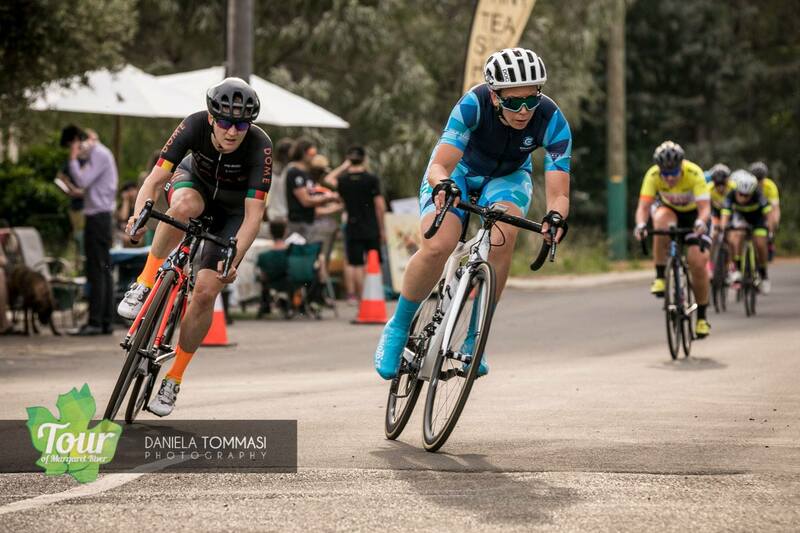 Stepping up to B grade and winning the Element Series after also winning Women’s C Grade series last year. Absolute consistency prevailed. 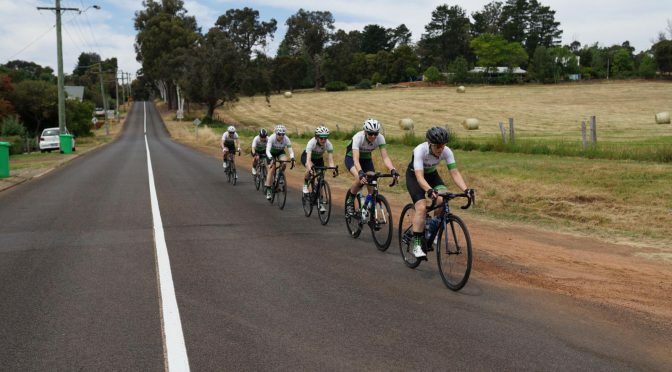 And topping that off with ToMR Stage 3 sprint mixing it with the A graders. Elar Kalda. Just keeps getting better. Jumping to A grade this year Elar consistently finished with placing in top 10s. And in the process pinching a Dome Coffees Racing Team call up. 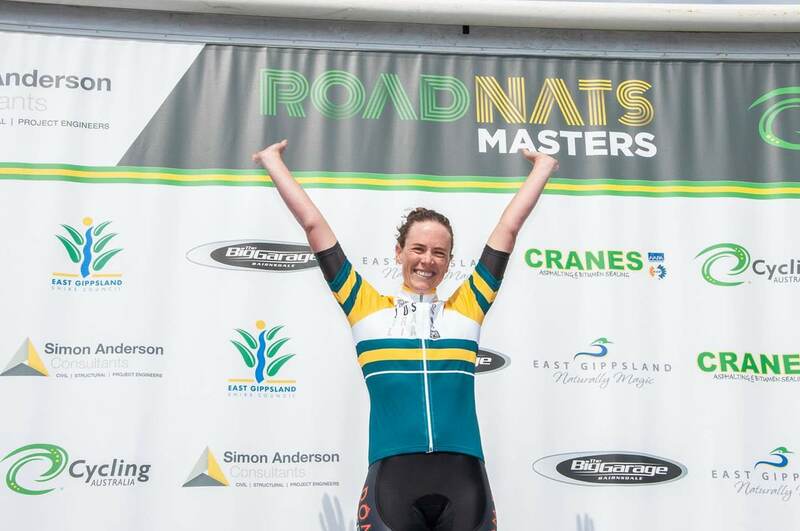 Michelle placed strongly throughout the year, but hit the pinnacle in Victoria winning the Overall Masters National Champion for her division. 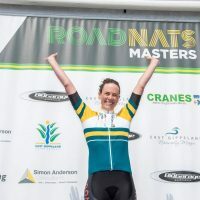 Amanda took Local, National and (UCI) International podium places for Road Racing and Time Trial and a crescendo-ed with a Cycling Australia nomination for National Masters Chick of the Year*. 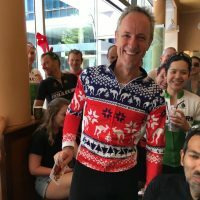 Pat’s take on “Xmas Jersey”. Well won, Mate. 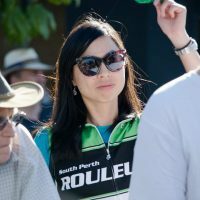 With another top 20 place at ITT Nationals in January, winner ToMR overall individual and just recently winning in the Thailand Tour of Chaing Rai Pat dominated. Including Crit wins. CRITS?!?! The “Golden Mo” Racing Photo of the Year is awarded to the SUBJECTS of a great Race Day photo. Sam Flockart and Dean Roser. At The Beverley, on the return leg and loving life these two flouted all three lessons offered by the Mo (1. Get in the drops; 2. Ride AT the photographer; 3. Look fast, don’t go fast) they captured all the emotion and feels of an epic challenging day. A huge thanks goes out to Jon “Hanno” Hanson, and to the endless generosity of our SPR volunteers. You know who you are! Congratulations to this years SPR Awards Winners. 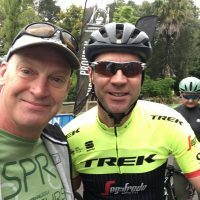 Tour of Margaret River 2018 – Race@SPR says…..
Jensie finally got to meet Poodle. Photo: Poods. 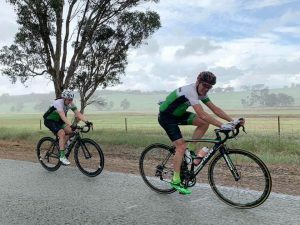 The whole event consisted of some lead up rides around the SW – including an Albany stopover and the Medio Fondo with Jens Voigt, Jess Allen and Matt Keenan. 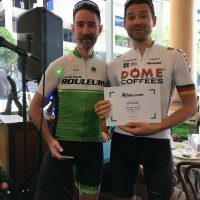 Meeting Jensie was a treat. He is just as excitable and personable in the flesh as you’d imagine from his hilarious interviews and commentary. 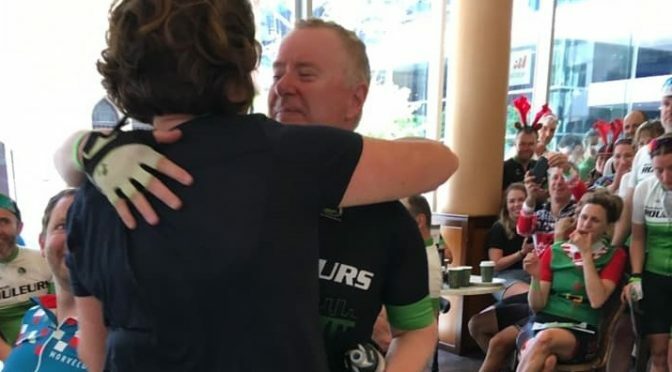 That he took my bike to lean up against his brand spanking new Trek when there was no space left at the cafe pretty much summed it up – both his enthusiasm and spirit of community. 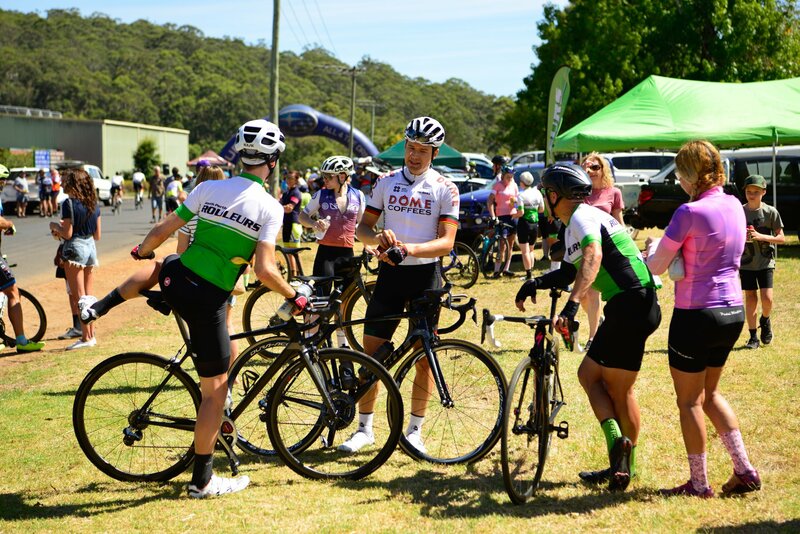 If only we got to share a beer as well…..
We’ll have race reports from the individual teams coming up over the next week from the three stages, but from Race@SPR here’s the broad view. 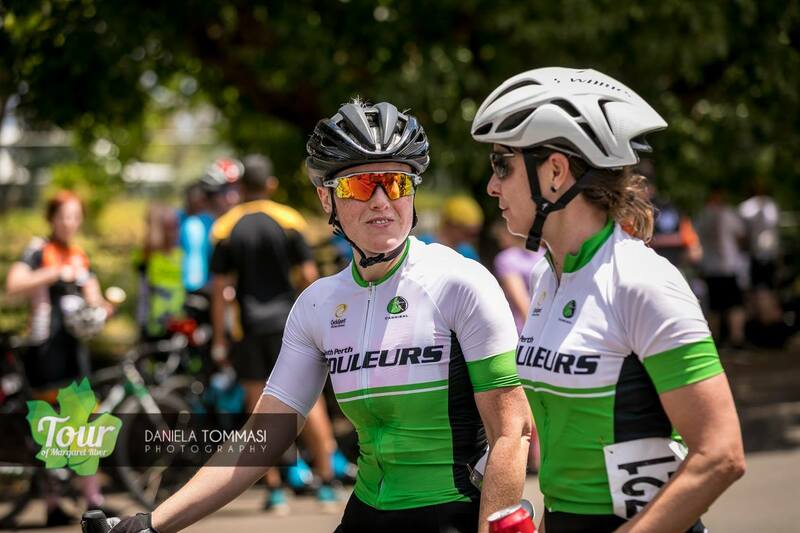 We were able to secure five SPR team places this year in green – two women and three men. 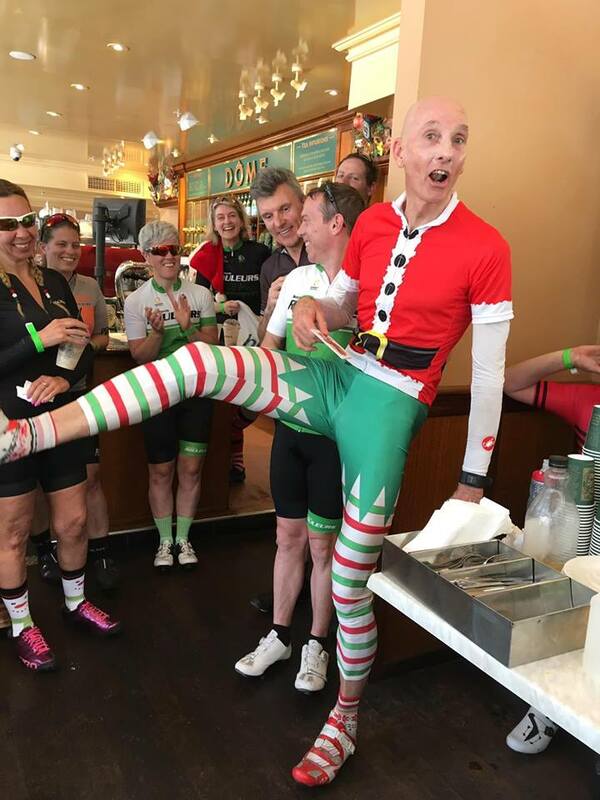 Amongst the other masses of racers were SPR members in non-green teams – Chaotic Energy in the women’s division, Cove Legal, JSTFUaR, King KOM and a few other moonlighters in the men’s divisions (Tim Hopkins in MCC – oh the shame!!) as well as the DOME Men’s and Women’s teams. Needless to say, there were many of us there. 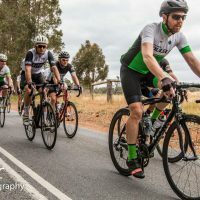 109km Road Race, where first and fourth team riders score points. 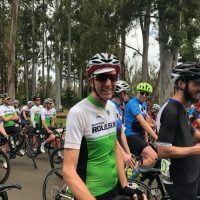 The points system did its job confusing all but the most applied accountants among us, but once racing started the concept worked brilliantly to spice up race tactics on the road. A great outcome for a new and initially mysterious system. The whole point of this stage race is that it’s a team event. 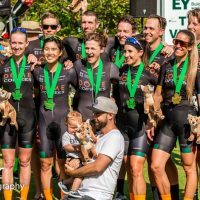 Teams of 6, a TTT that takes your 5th riders time, NOT the first rider, the final stage awarding more points for the 4th rider of a team. SPR takes it further and makes this a true Club outing. We select our teams, train together, stay in accommodations together, eat together, travel together….. you get the idea. 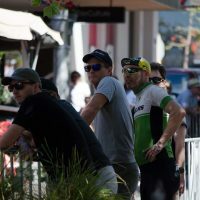 In this year’s case, there were parts of previous year’s teams racing together again. And with familiarity comes speed. 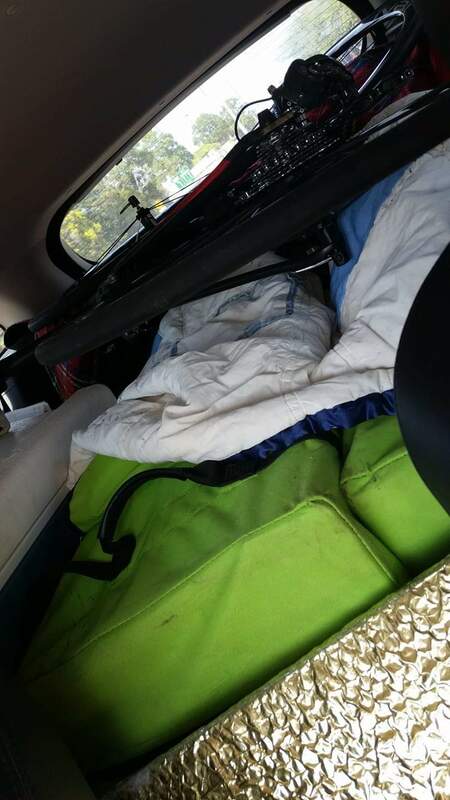 Organising for 35 racers and volunteers to accompany for four days some 250km away is not a simple set of tasks. 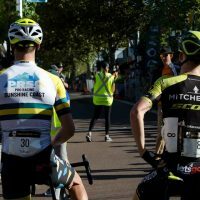 The reality is that we usually go through about 150% of the final number of racers needed by the time race day comes around. Sorting accommodation for 35 people, within reasonable driving distance and at a reasonable price and quality and is available, chasing up payments, setting up team registrations and collecting all the monies for teams, planning the logistics of travel, of teams and bikes, coordinating times, organising Club tents, eskys, flags and equipment, shuttling of team cars from start to finish points with the volunteers, communicating to the racers over the lead up 6 months to event …………..
For the past three years, we’ve been doing this on top of and right on the back of The Beverley, which inevitably impacts on time for my own training and prep. Around 450 hours’ worth of time. Excuses, at the ready. 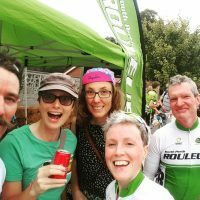 Race@SPR’s highlights? Well, there’s a few…..
SPR M3 put in an unexpectedly huge effort, gelling as a team and placing beyond expectations. 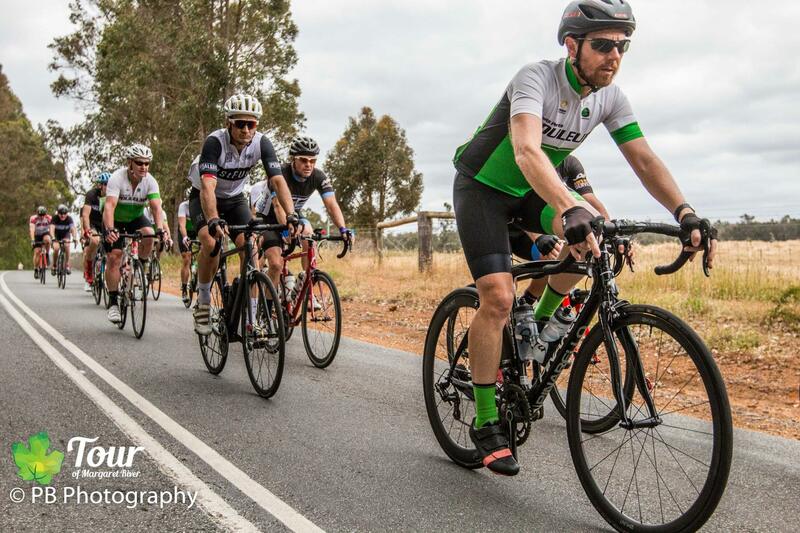 M1, who were returning against some seriously big hitters rode like a true Team. 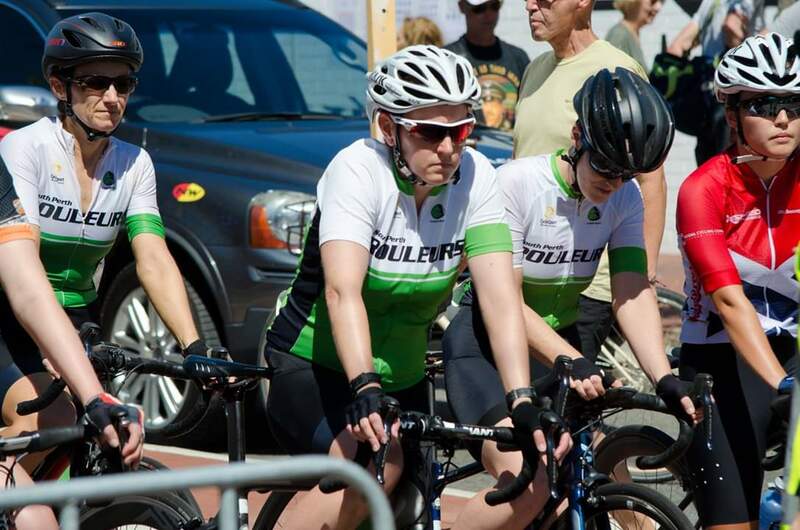 Our SPR W1 Womens team placed 3rd overall in the Womens’ division. Beaten only by DOME (with the current Singaporean National Champ btw) and a stacked Veris Team. Less than 4 minutes behind the TT heavy talent base of DOME in stage 1. 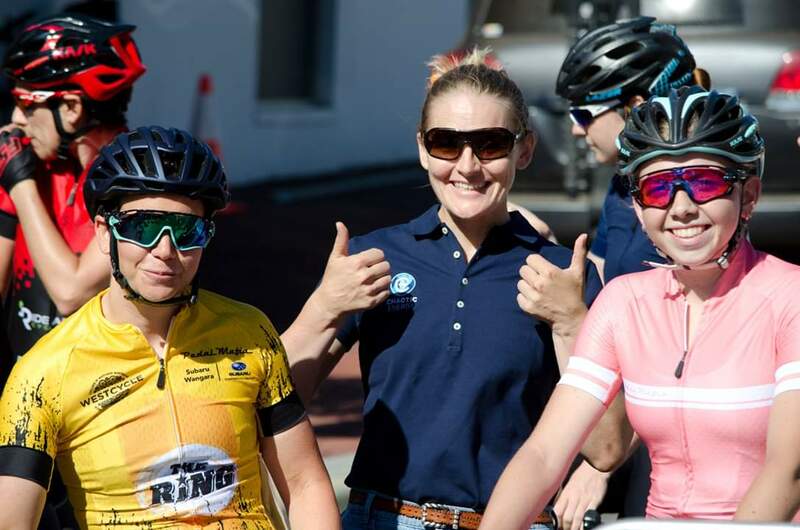 Abi Smeaton took 3rd place on stage 2, beaten by a tyre width by the current Singaporean National champ, Serene Lee. 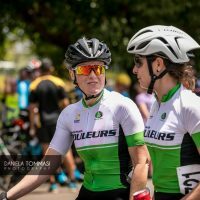 Then a blistering ride from Kirstie Moore on stage 3 sprinting for 9th place and nothing but top end A graders ahead of her. 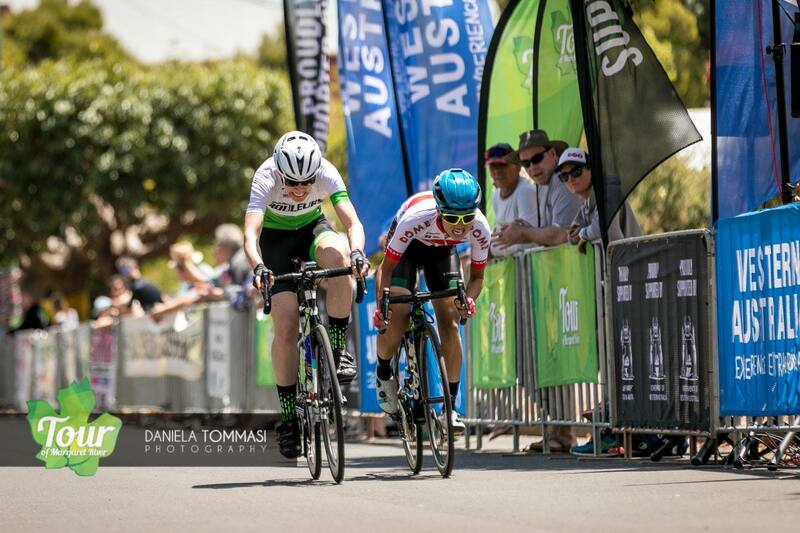 This was a seriously fast bunch sprint too, and she nailed it. To round it out, W1 were the 2nd team to have their 4th rider finish taking a massive chunk of points. 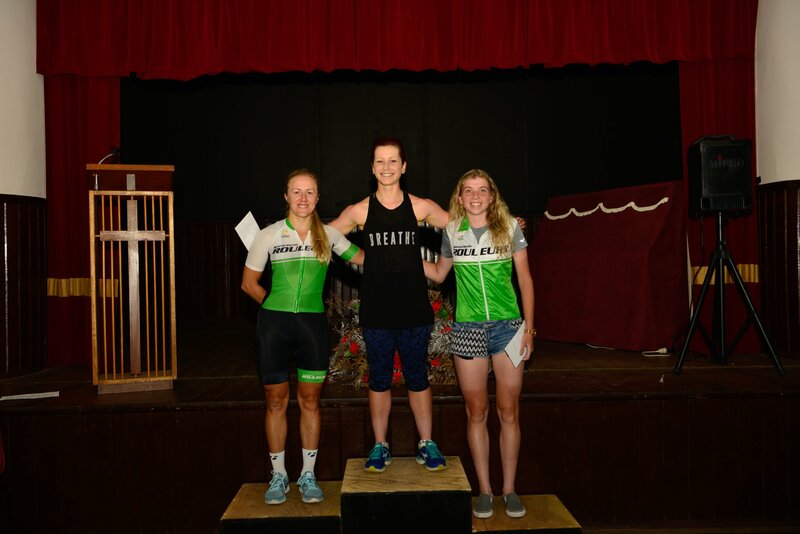 Our Club took third overall in the women’s division – a cracking result amongst some very fast Chicks. 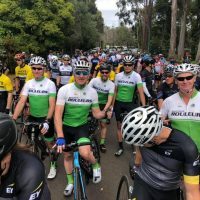 Amongst the inevitable social media onslaught (for which I apologise for nought – I am but a helpless camera whore myself), there is more to this Club trip than just the twits pedaling around in green kit. Above and beyond all else, a huge thanks goes out to our volunteers this year. 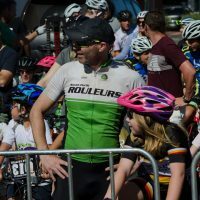 It was the Rouleurs Soigneurs that essentially made everything logistical seem like nothing. We, the racers (and DS’s) didn’t need to do a thing. 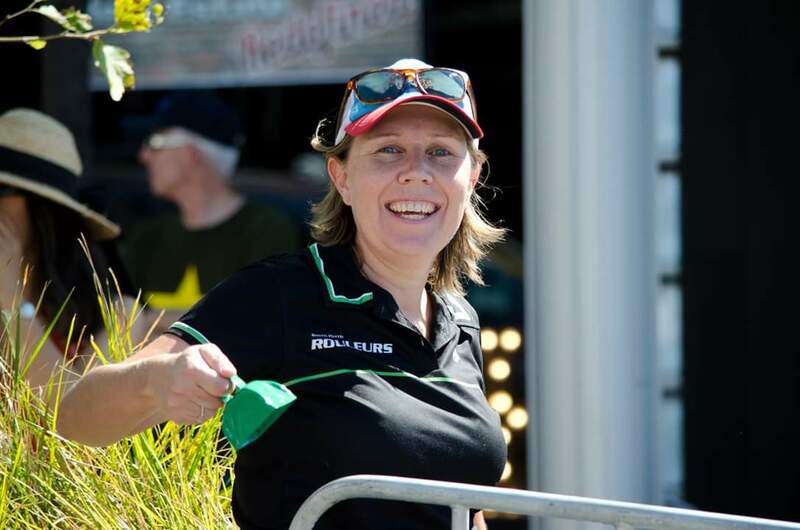 Michelle Bonner, Cathi Dixon, Greg Jones, Mike Madsen and Callum Stott – you are the true champions of this weekend. 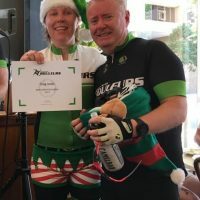 The results and achievements of the racers wouldn’t have been possible if we needed to faff about and coordinate anything once we arrived. I extend my endless gratitude to you fantastic five and everything you so generously invested. Write it down, read it back to yourself – THIS is what Club is about. 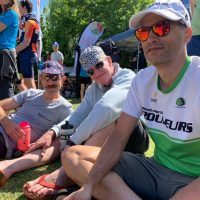 There’s a bunch of Race Reports to come – some horribly biased and very loosely based on fact. But a whole lot of fun nonetheless. Check out the links below. Cheers to rest weeks! Wahoo, great I survived Day 1 of the Team Time Trial, now for Day 2. 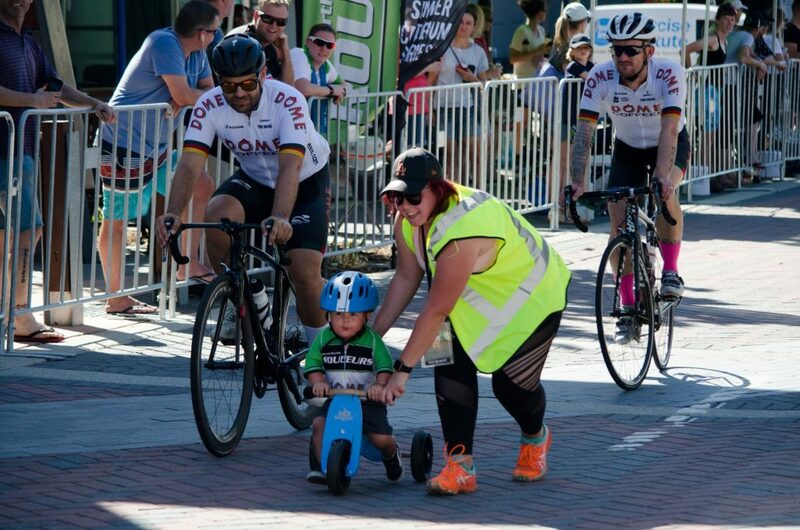 I’m fully briefed on the team strategy “SPR Secret Weapon” – first wheel over the line gets the points so stick to the front of the bunch and when the ‘break’ is made jump on. I’ve got my nutrition on-board…in my bentobox which is apparently so not cool. Right we’re off…following a car – what??!! Ok well at least I have a chance to work out this peloton thing while we are cruising at this nice easy pace. It’s definitely not a nice two-abreast ride with SPR, instead it’s a messy bunch of chicks on bikes where one second I’m following a wheel and the next its gone. Oh crap, I’m stuck on the left and people are passing on the right, hmmmm this is not what I was told to do (keep right and stay near the front) how to get out of this position? 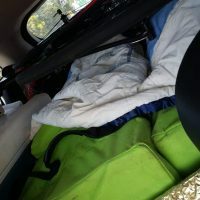 Thank goodness for my teamies who see my distress and tell me to move out in front of them. The car waves and the race starts. We start the climb and a couple of girls are off the front ahead of the bunch. 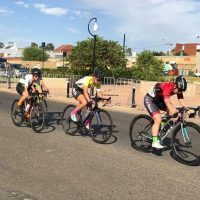 I’m on a continual cycle of losing position moving back through the bunch then popping out and moving back up to the front. I’m nervous, sweating, and begin wishing I was up ahead with those two girls. We continue climbing and the pace is pretty easy but I’m still yoyoing around. I’m moving up the front when I bump shoulders with Amanda – OMG what a newbie! Lucky she’s very cool about this but my cheeks are burning – so not cool. 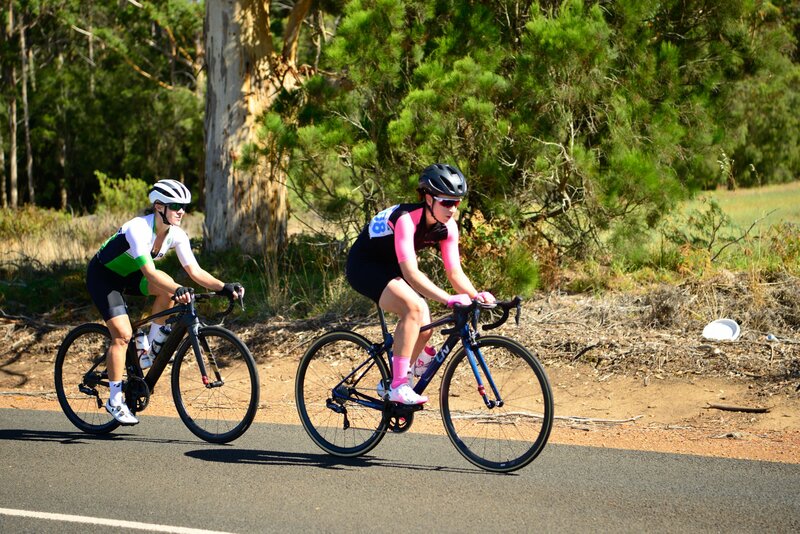 I’m part way back in the bunch when I see a few of girls surge off the front, I hesitate “Is this the break?”. Then I hear yelling from behind “Go go go” – is that for me? After what feels like ages I decide to go for it and get away from this bunch business. 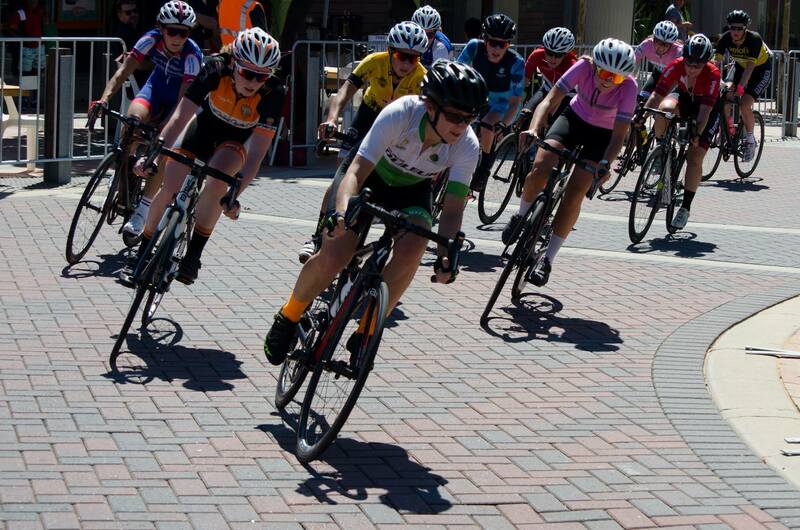 I surge forward ahead of the bunch and immediately regret my hesitation, those girls are a way up the road now. I settle in and push hard willing my legs to keep pumping, I’ve got to catch those girls. 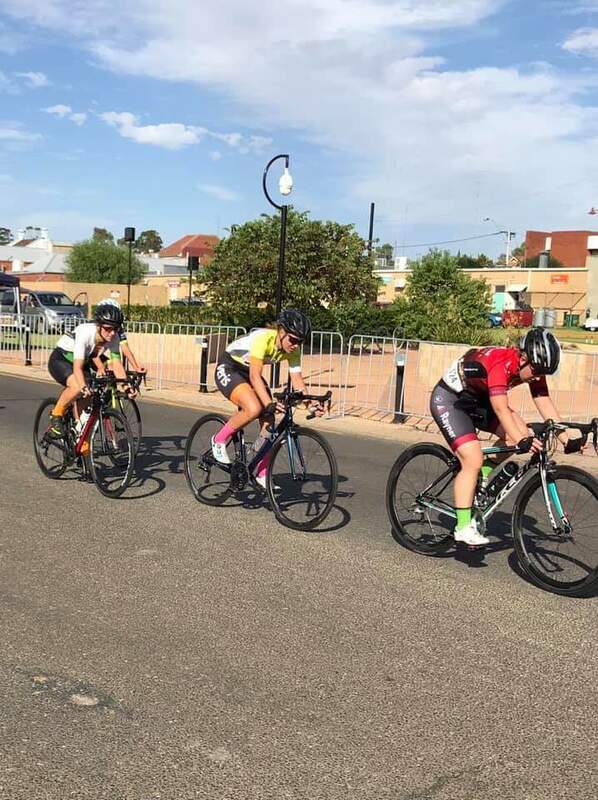 I pass someone dropping back to the bunch but the other two girls are still up there so I keep pushing. Finally I catch my ‘break buddies’. One of them asks if we’re all willing to work together, I’m in but the other girl isn’t. Kirsty, my TT buddy and I set off with enthusiasm. We’re both delighted to be out of the bunch. Now to hold the rest of the girls off. We keep up a steady rhythm of a minute or so on the front and I keep looking over my shoulder expecting to see the bunch swallowing us up. 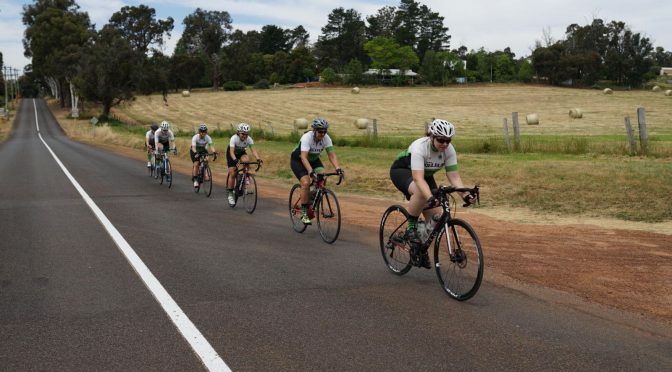 I worry for the next 10km that I went too soon but little did I know the rest of the team was working to keep the bunch pace slow to let us get away. Finally, with only a few kms to go I see two K-division numbers up ahead. Kirsty tells me to go ahead, I’m strong on the hills and it doesn’t take long to catch one then the next. Dam I can’t shake her. We pass 500m to go and crest the final hill. She’s right behind me and I know her cornering and sprinting will be superior to my triathlete endurance. We turn the corner and it’s a sprint finish, I can hear her just behind me. I’m ‘sprinting’ to the finish line pushing my bike infront of me like a jockey urging his horse to the line. I’m almost there when I see her wheel sneak in front. Third…I can live with that. I go to congratulate Serene but she can’t talk, I start thinking I didn’t try hard enough. Guess I’m now the Not-So-Secret Weapon. 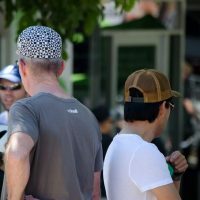 There are only two types of cyclists. Sprinters & climbers. You can see the difference a mile away. Sprinters have guns. Climbers have chicken legs. Sprinters come first. 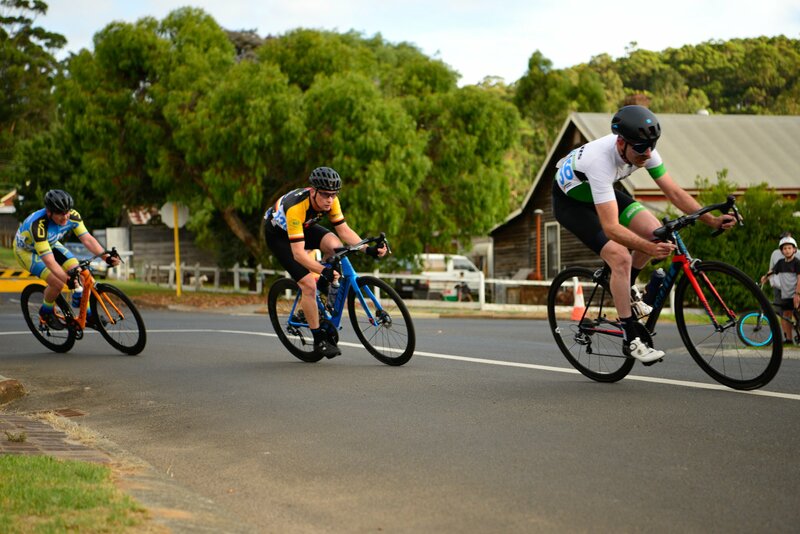 And the SPR Men’s 3 United Nations Team was all about being first. No chicken legs here. Australia, Italy, South Africa & the UK all represented. The Prez, Poods, Barry, Andrea the Strong, Dermot & Ash, known collectively as BAD-Ash. Race day kicked off with pre-race team briefing at the W2 house. M3 in first, sprawled over the lounges keeping things chilled. First to be cool. The TTT saw M3 away first. The team kept it tight, nailing the first cameraman at 500m in a move that even The Mo coveted. 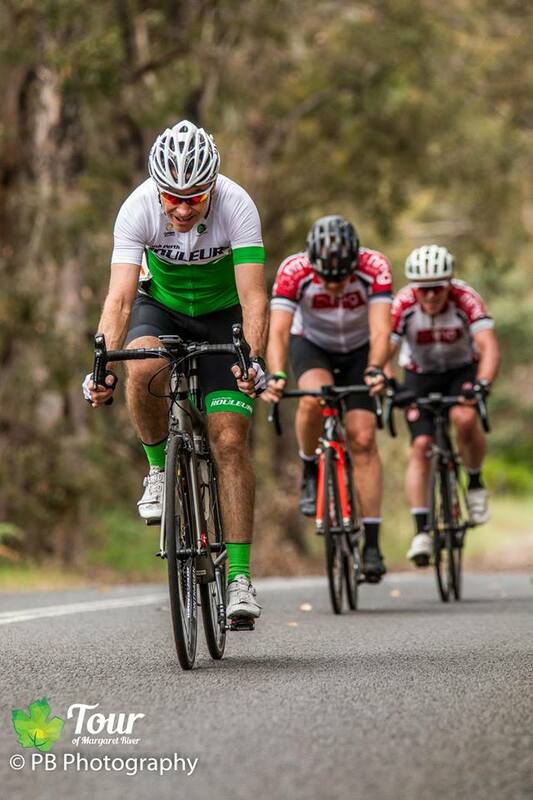 The rolling climbs & descents quickly took their toll on all teams, with M3 passing six other teams by half way. 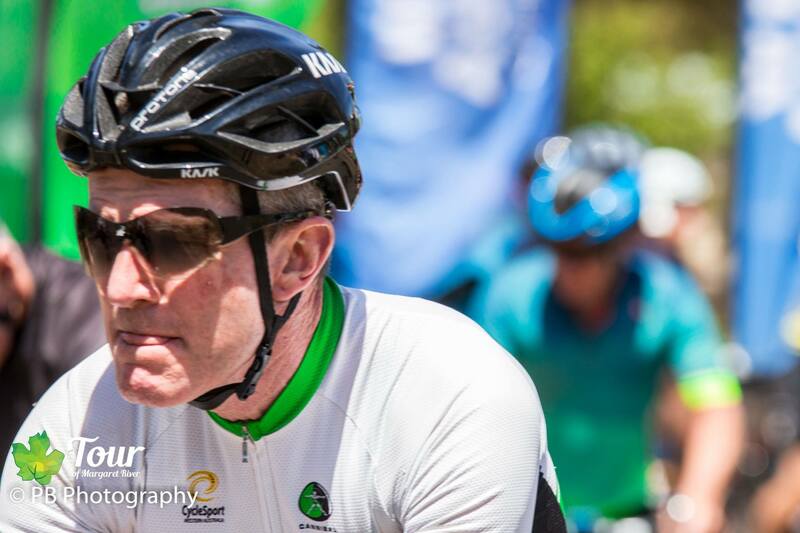 Dermot screamed “AAARRRGGGGHHH” which was the team sign to cut the 6th rider & pick up the pace. The speed increased, the weather got hotter, Poodle sweated even more. 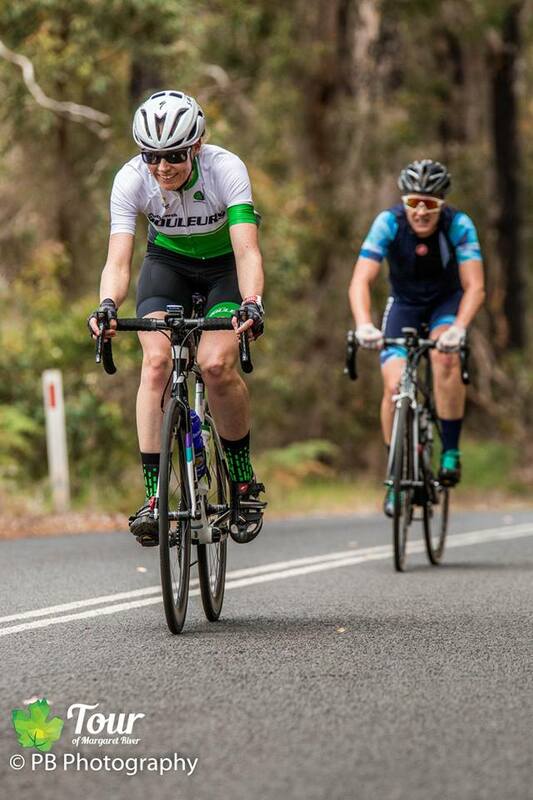 The Hand of God (aka Andrea the Strong) pushed Poods over the last climb. Andrea will never wash that hand again. Day 2 would be for the climbers. It would all blow to pieces early on that first hill. 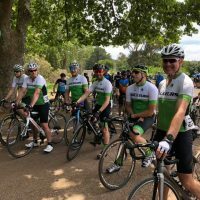 Team plan – be at the front for the start!! The UN Team started well, getting the first selfie of the day with Jens Voigt. Now it was show time. The team stuck to orders, pushing all other riders out of the way to be first on the start grid. Dermot shoved three Midland riders to the ground. Ashley coughed phlegm all over the start marshal. The Prez made a Black Swan rider cry. Best start photos ever. M3 led the massive field out of town & up the first climb. The field strung out & riders from the earlier divisions started to appear. The Prez put the hammer down. Again & again he struck his blows. Poodle became the sparks, and the rest of the field was the anvil. 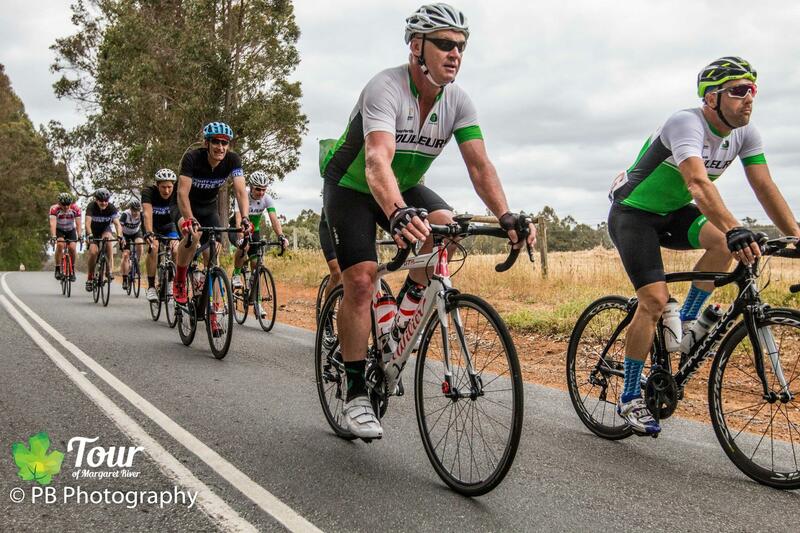 The Prez & Poods rode away with the leaders, while BAD-Ash followed team orders & sat up for a cruisy groupetto ride. The Prez kept Poods in touch up all the climbs. The Prez was heard to say “I think I’ve broken the Poodle. I think I’ve broken myself!” Poods was calling it “I’m done for Prez, save yourself, go for the win!! !” The Prez railed “I’m not leaving you Poods! !” A Roues Chaudes rider heard the Prez’s voice cracking with emotion. 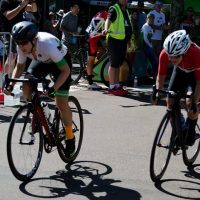 The duo were looking good until they were swamped by a bunch of wheel suckers at 1km from the finish. 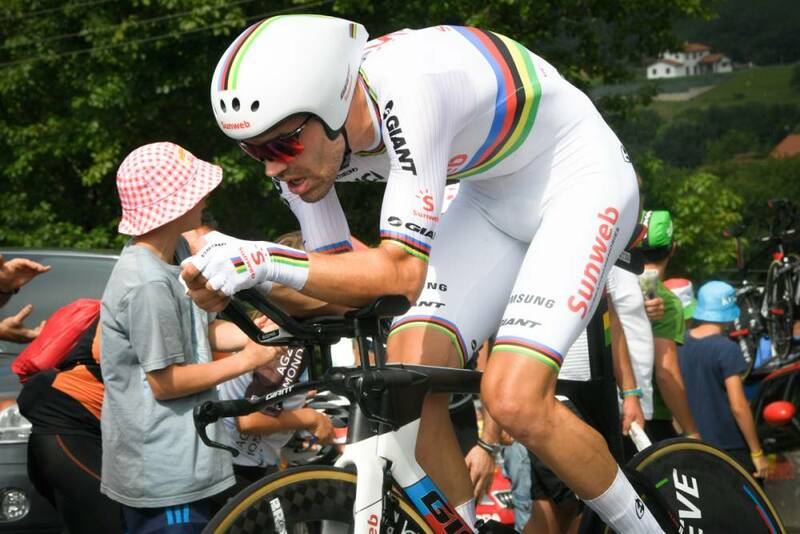 But the pair still managed a beautiful finish, arms linked & held high like Hinault & Lemond at Alpe d’Huez in ’86. Poods scored a DSQ for being overweight, another first for M3. Day 3. Could M3 produce the money shot? The team led out on the front briefly, before letting all the other mugs do the work into the headwind. BAD-Ash followed team orders, staying tucked in & sheltered from the headwind. 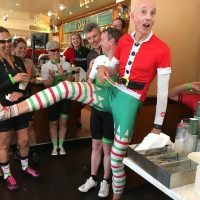 Freshest legs in the entire peloton. We will need them later! 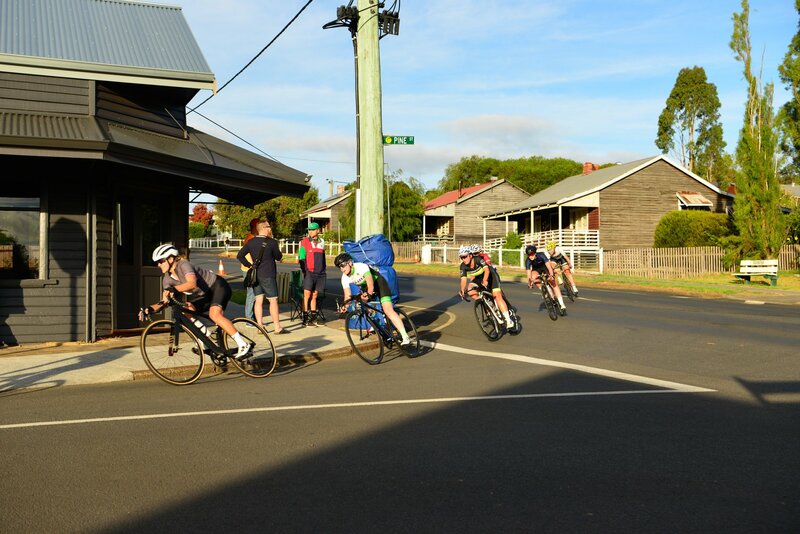 A few B-Grade ring-ins went off the front. Let them go. The Team sniggered at the odd plonker trying to make a break into the headwind. They’ll be back. Move up & be ready for the right turn into Sues Road. Head wind becomes tail wind. Full gas. The Prez confidently led the fresh legs of BAD-Ash through the melee and the red shift. Poods kept a loose cover at the back bringing back any worthy discards. 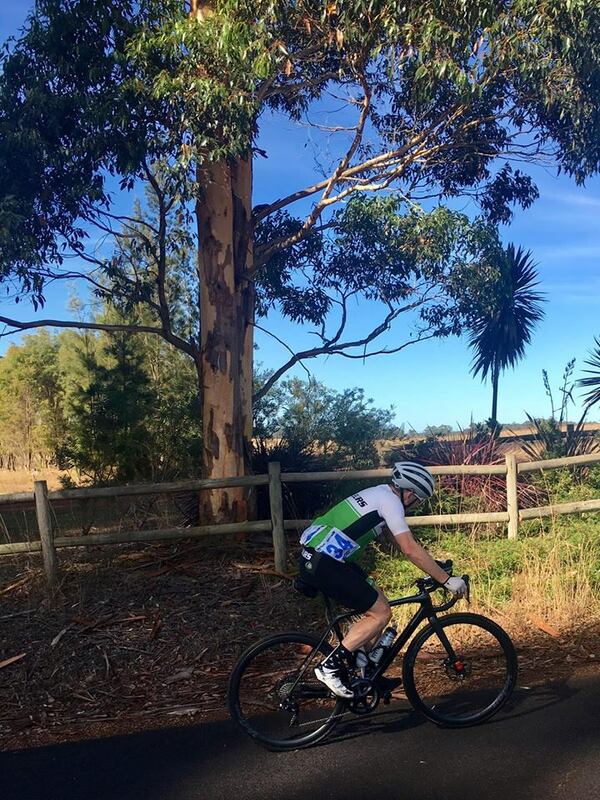 The climb at 60km saw the bunch thinned, like a grevillea branch through a mulcher. BAD-Ash moved quickly up the climb, as we closed on the bunch in front. Andrea the Strongsacrificed himself to keep the back end of M3 in the game. The rolling grind home along Mowen Road had El Prez playing numbers games. He has a mind like a planet, calculating the finishing numbers of our team versus the others, for the magical fourth place. Poods struggled to count to three. Ash kept up the race signals, with a loud cough meaning GO!! Barry covered all the moves up front. 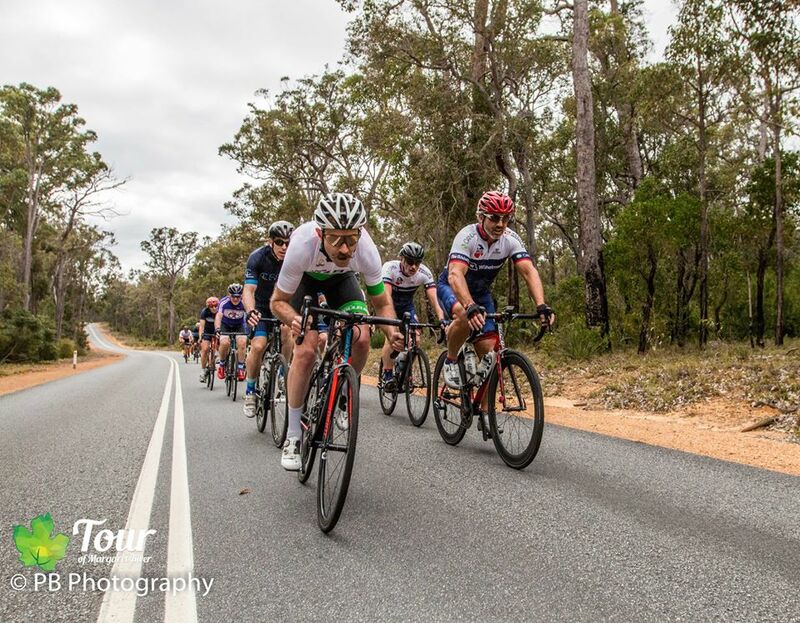 The final climb & turn back into Nannup had the field of 40 now reduced to 15, including the 5 SPR riders. Or was that 4 of us? Nope we’re down to 3. That last cough meant ease up. The Prez went back for Dermot. He would never quit! Barry channelled the Prez’s anger to beat the Black Swan rider up front. 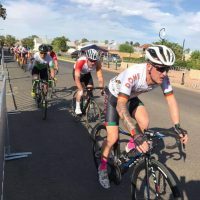 Poods caught nowhere in the middle was a free agent, delivered a gun-like explosive sprint to beat two women riders to the line. Ash scored the coveted 4th place points. A fine & noble finish. And in another first for SPR, there was not a single #fts dummy spit from El Prez. And the M3 UN Team were first into the post-race beer!